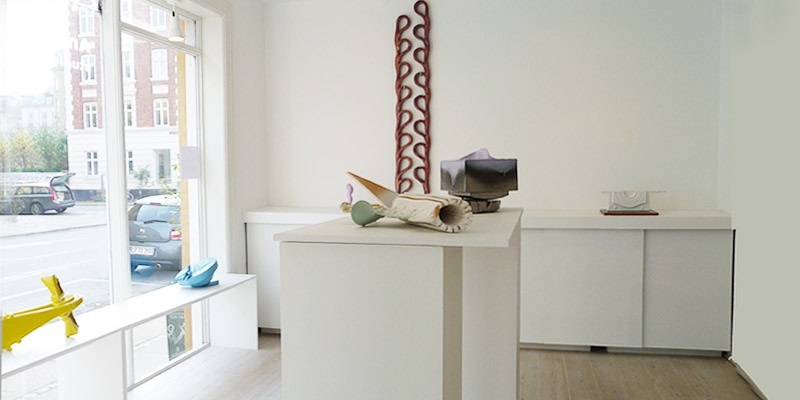 OPEN IN DECEMBER Tuesday-Friday 11-18, Saturdays + Sunday 23 December 11-17. 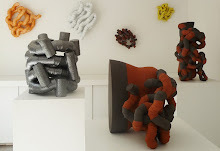 Craft challenges industry - new colours and blue print. 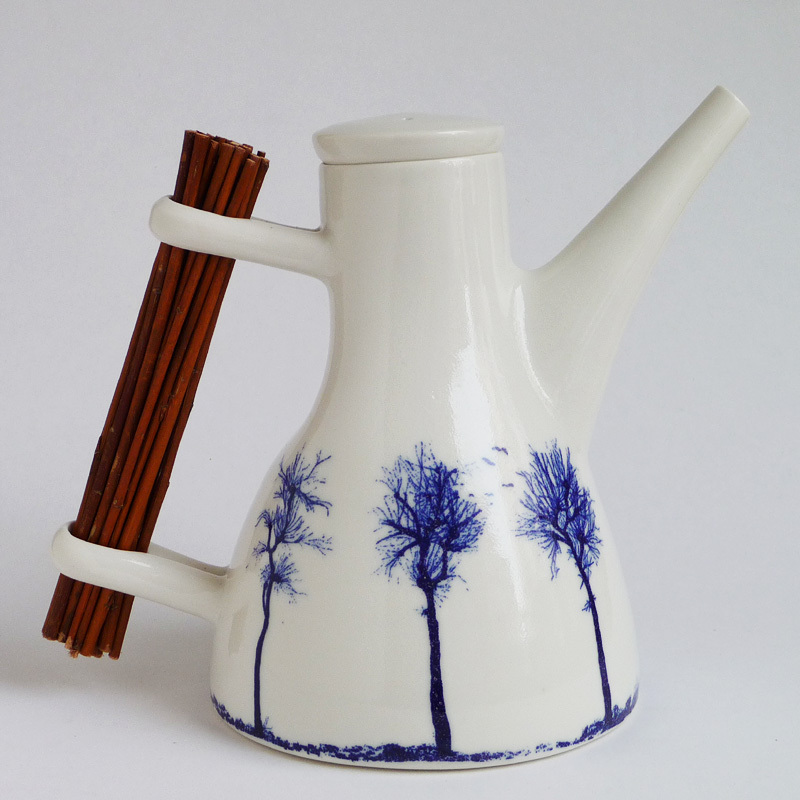 Focus on crafts, personal utility items with traces of the hand. 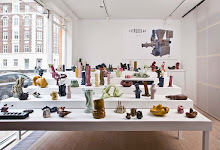 The exhibition talks about two kinds of functional ware that in various ways refer to the industrial product, but carried out in the studio workshop, and largely the result of the hand's ability to create unique high quality functional pieces that can be loved by generations and stay through time. 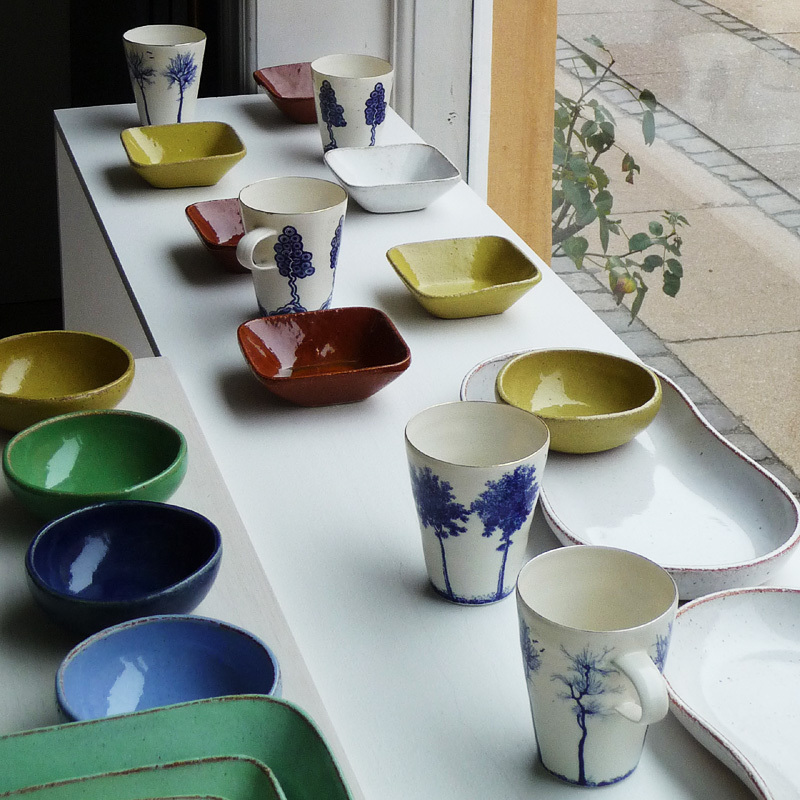 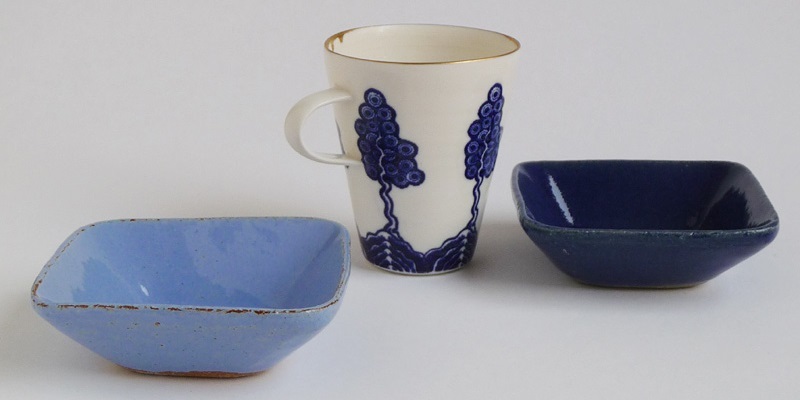 Beautiful colours and simple forms by Ursula Munch-Petersen are combined with blue and white porcelain by Ann Linnemann and Paul Scott. 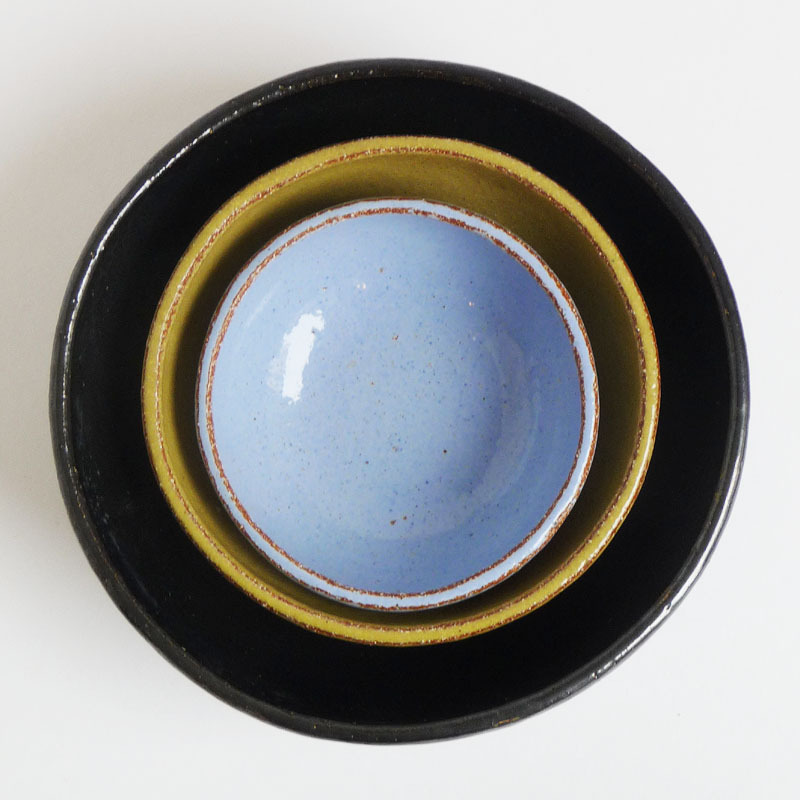 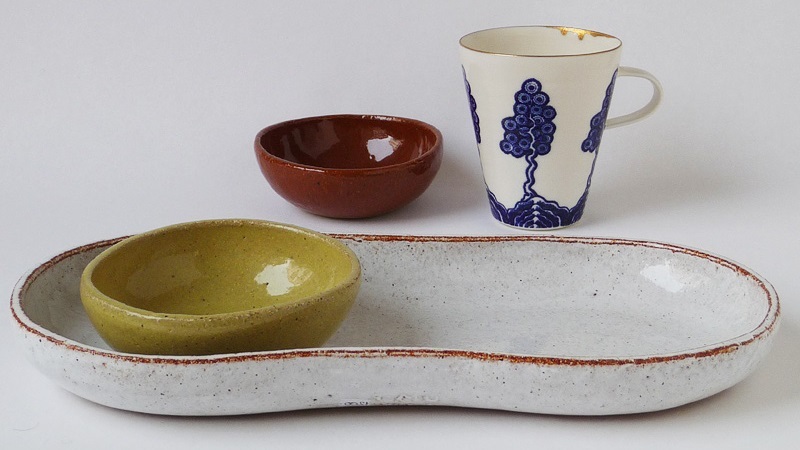 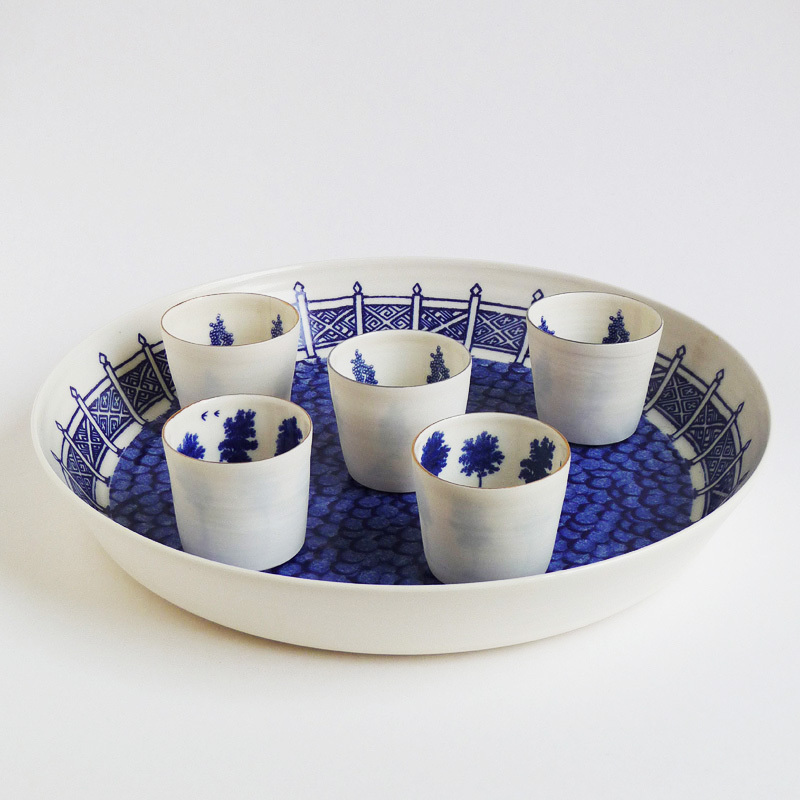 Ceramic designer exhibits crafts from her studio workshop. 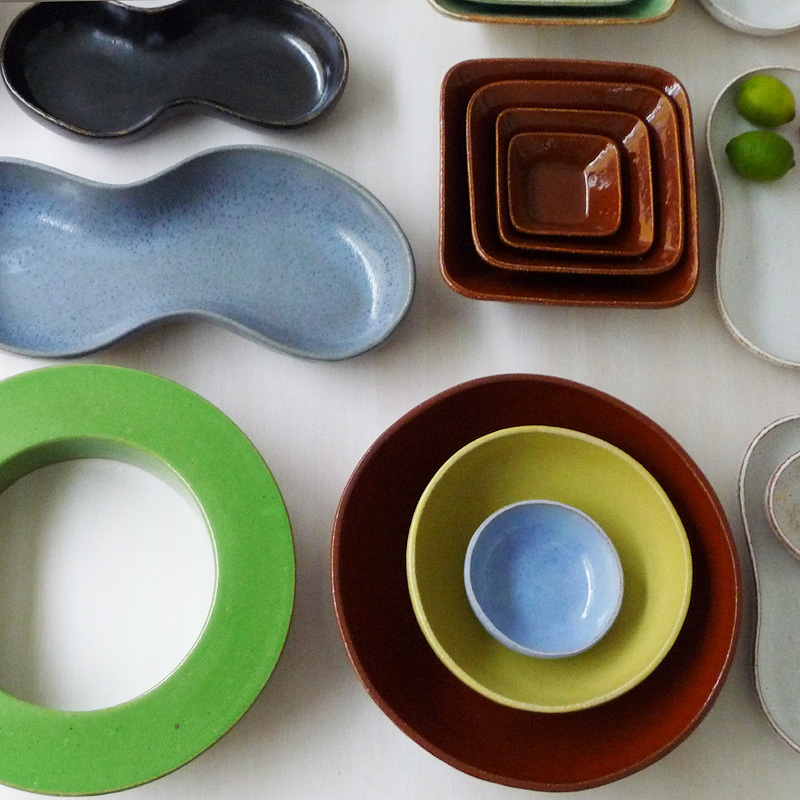 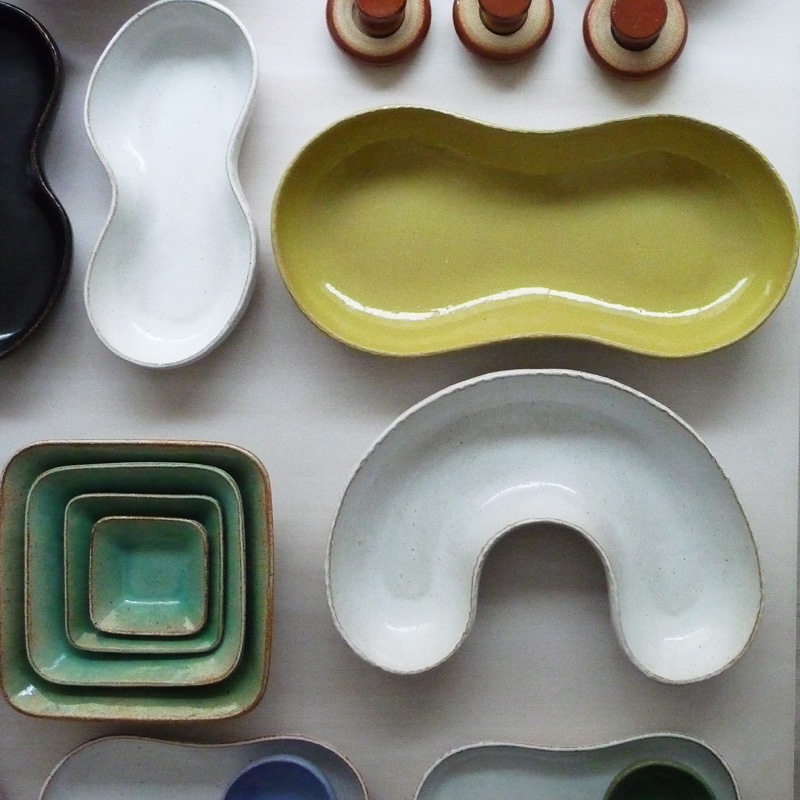 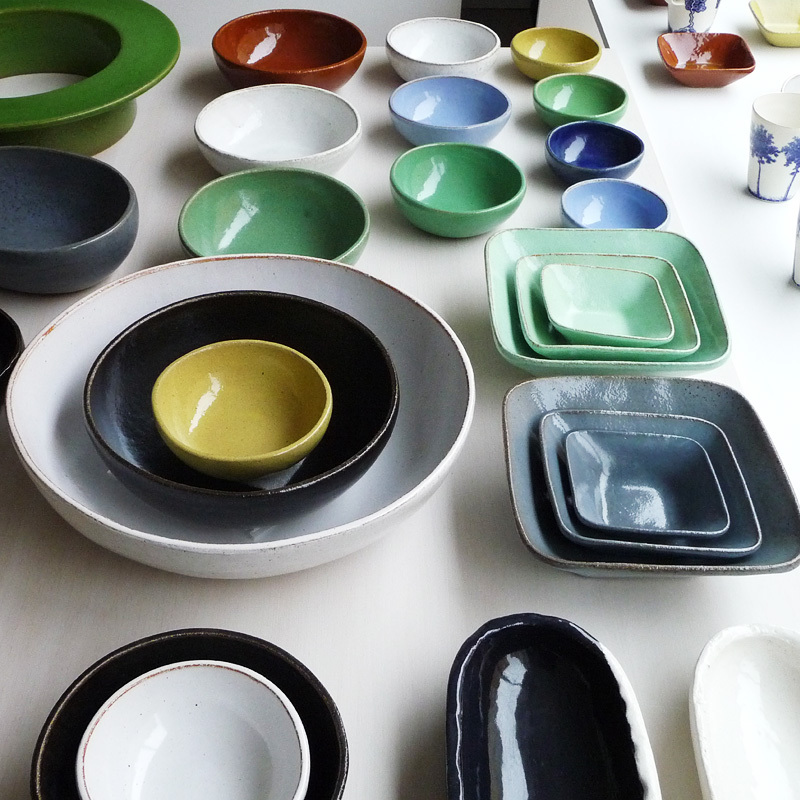 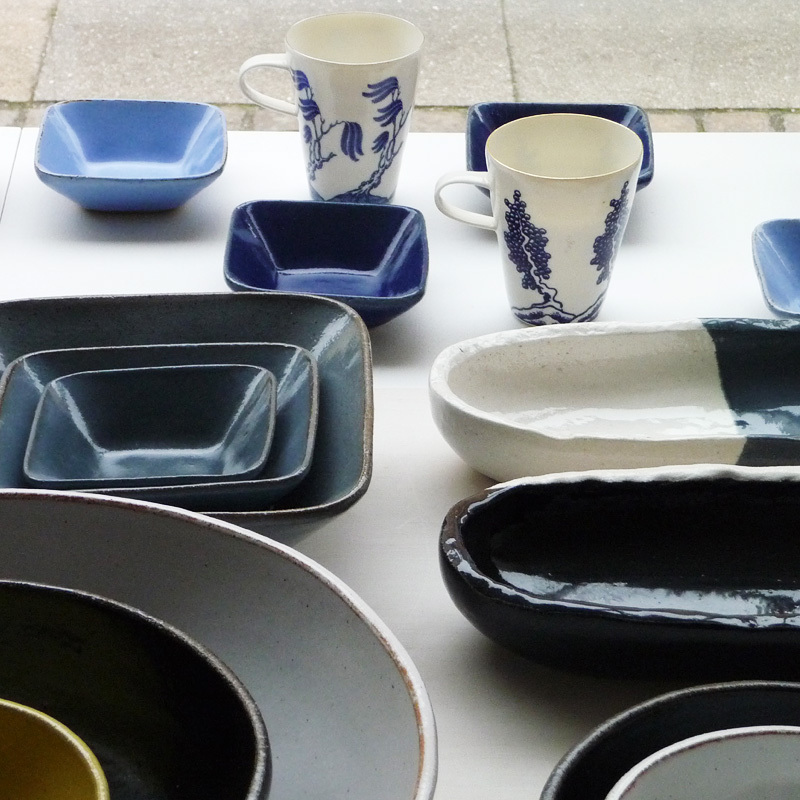 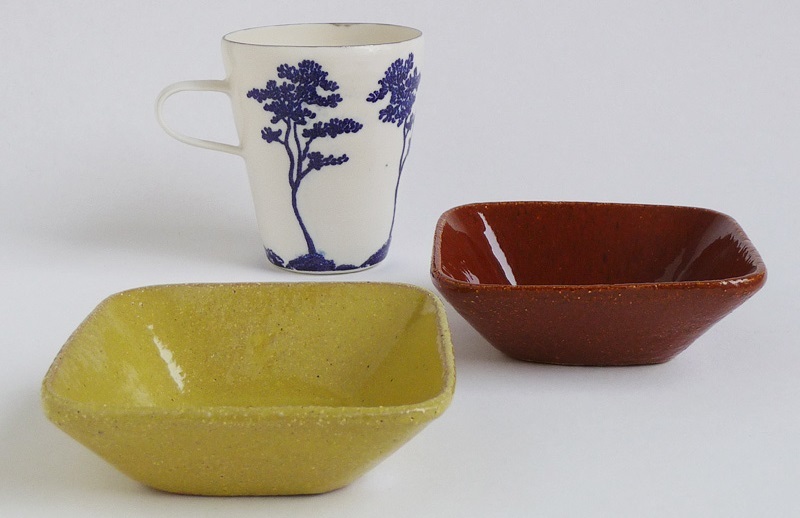 Ursula Munch-Petersen is acknowledged for her eminently designed functional ware for everyday use. 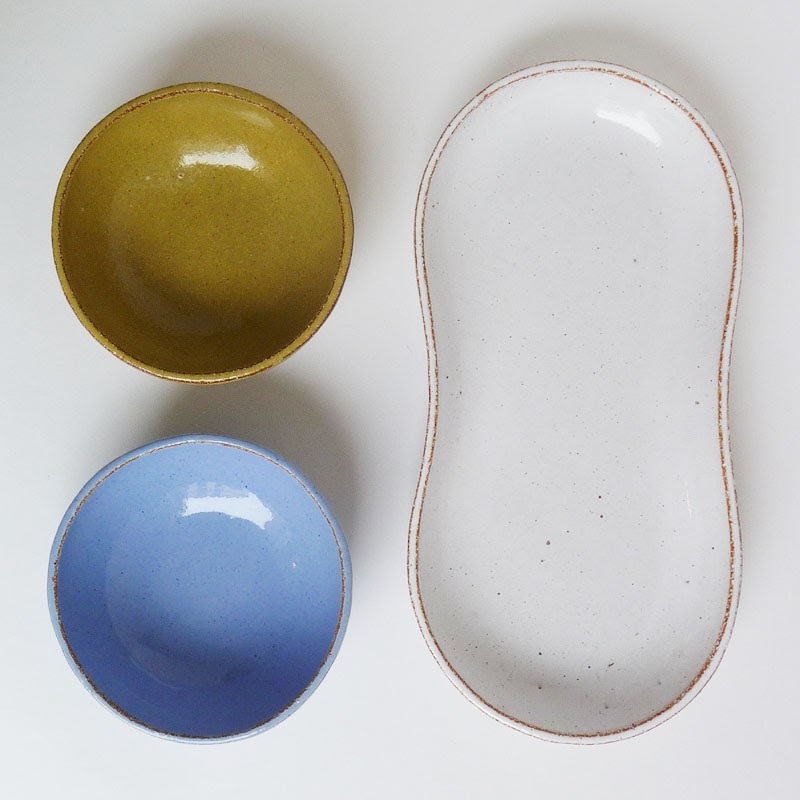 From beautiful crafts, her pieces have become good industrial design products, often having the same feelings as in good crafts. 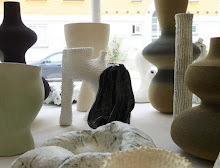 Over the years, she has created numerous works, experiments and prototypes for design for industry and studio production, unique pieces and commissions. 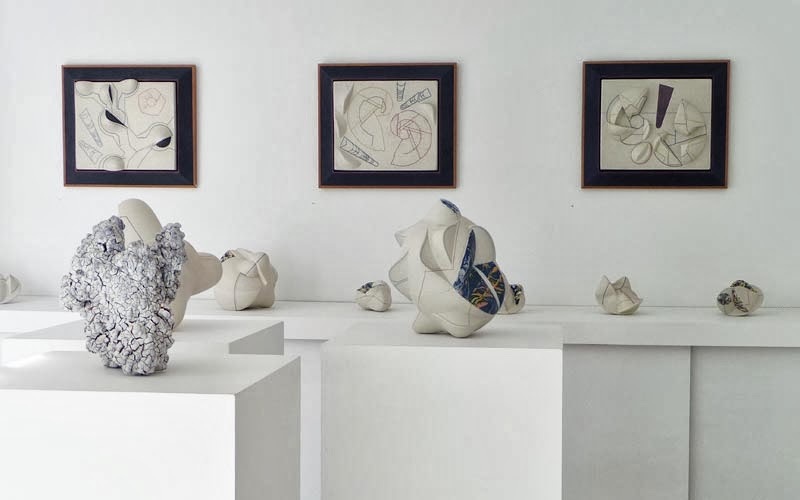 This exhibition features new pieces from her own studio. 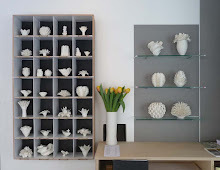 There is an honest connection between the hand's work and common sense. 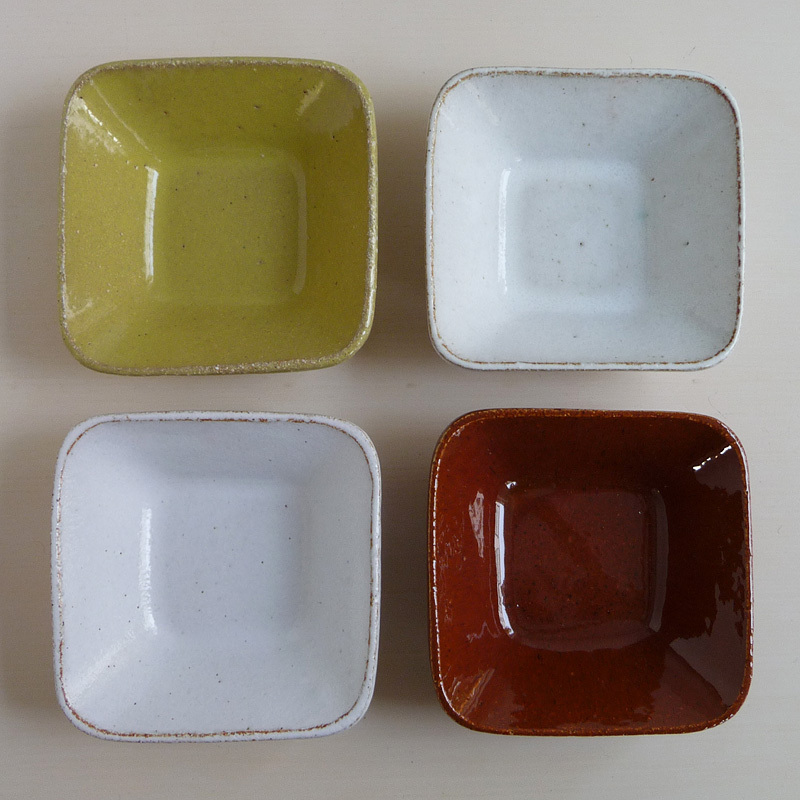 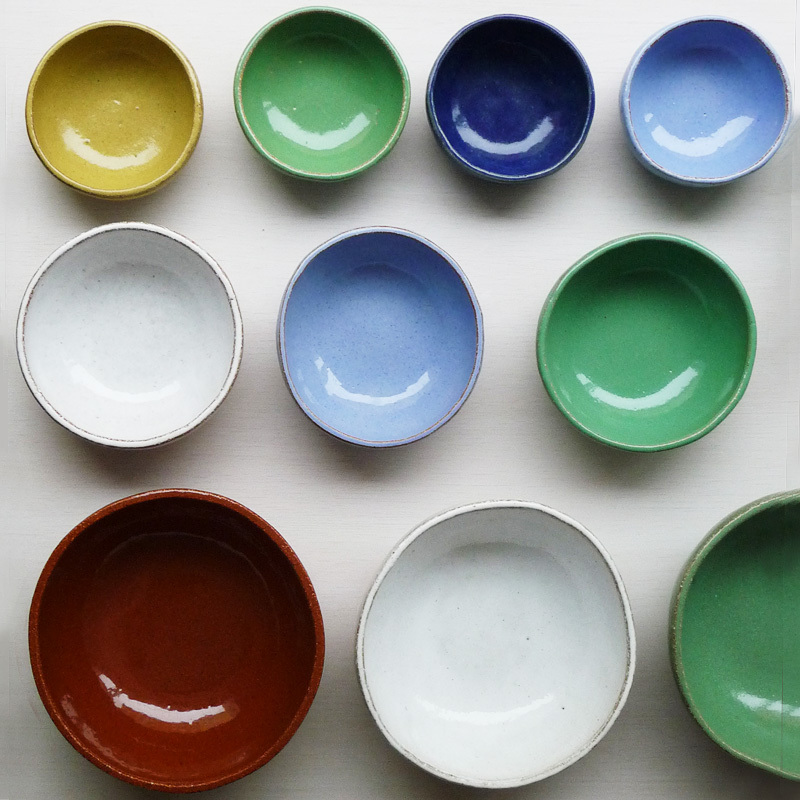 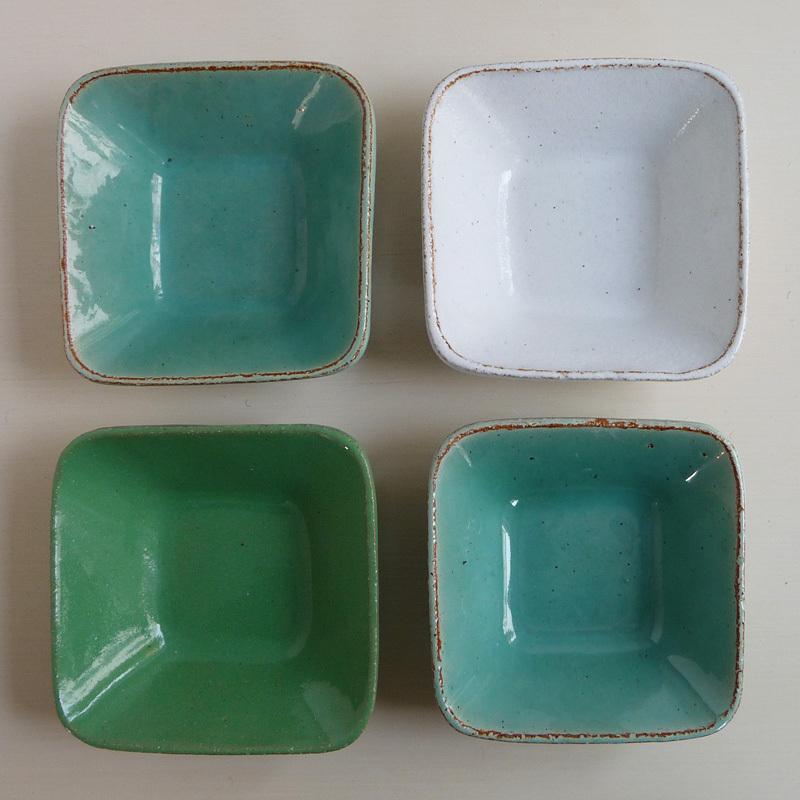 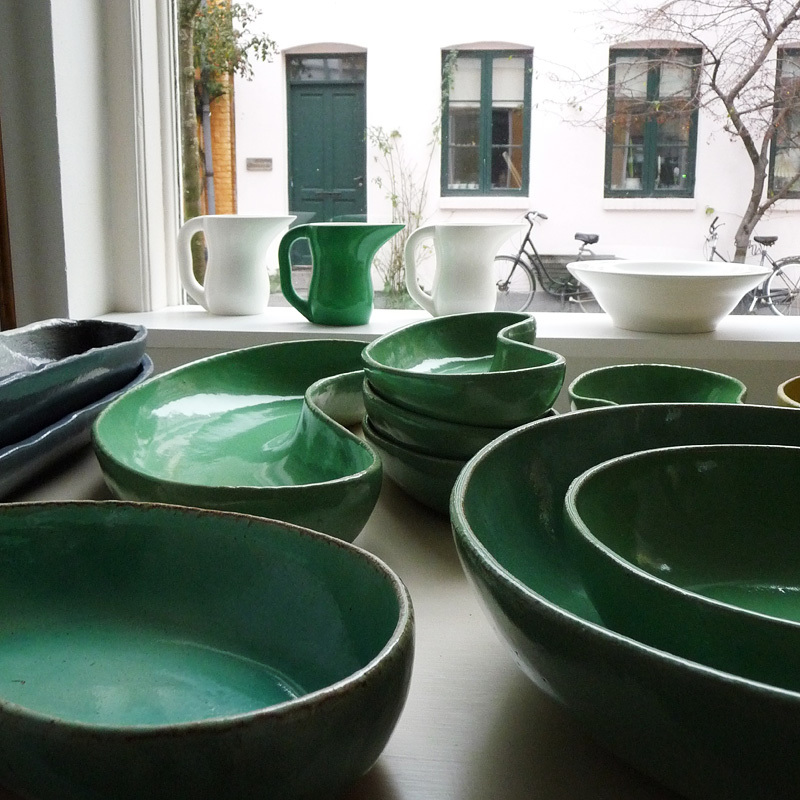 Many know Ursula-dinnerwares, dishes, bowls, cups and jugs of strong colours and distinctive shapes. 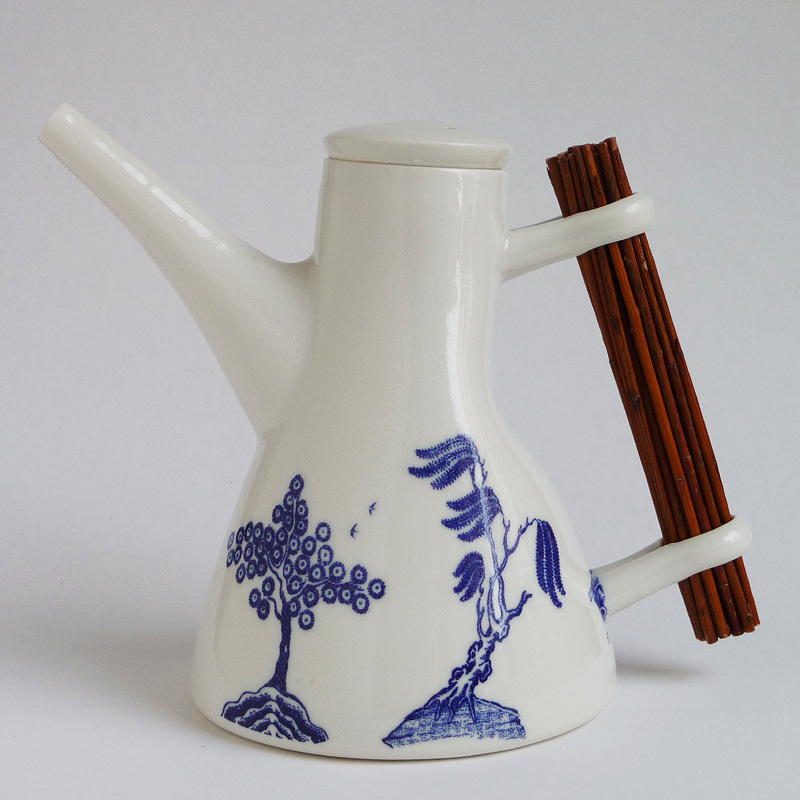 But few have as Ursula understood to combine new design with good craftsmanship, for everyday use. 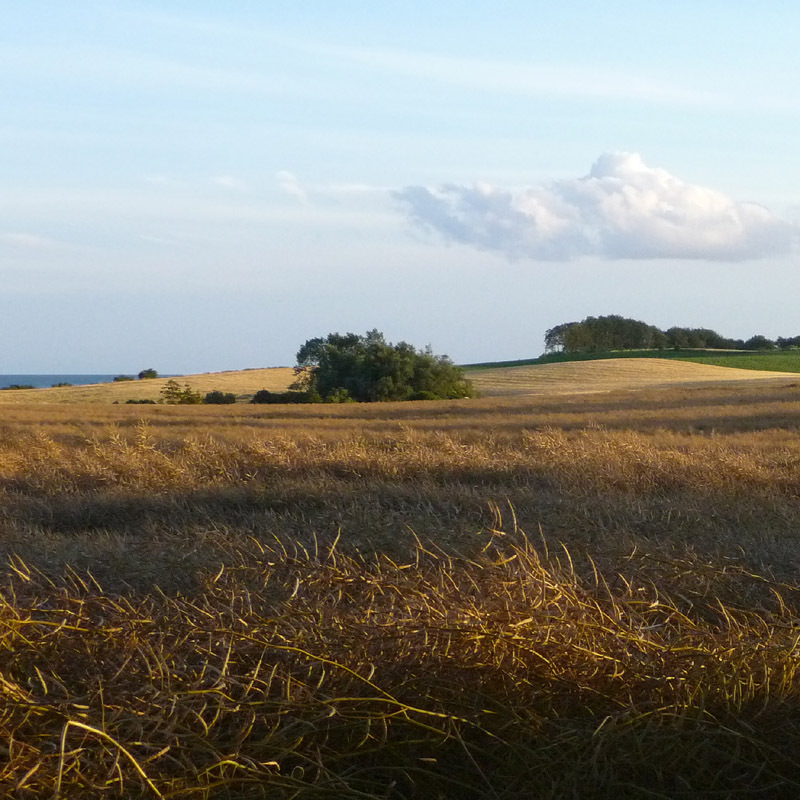 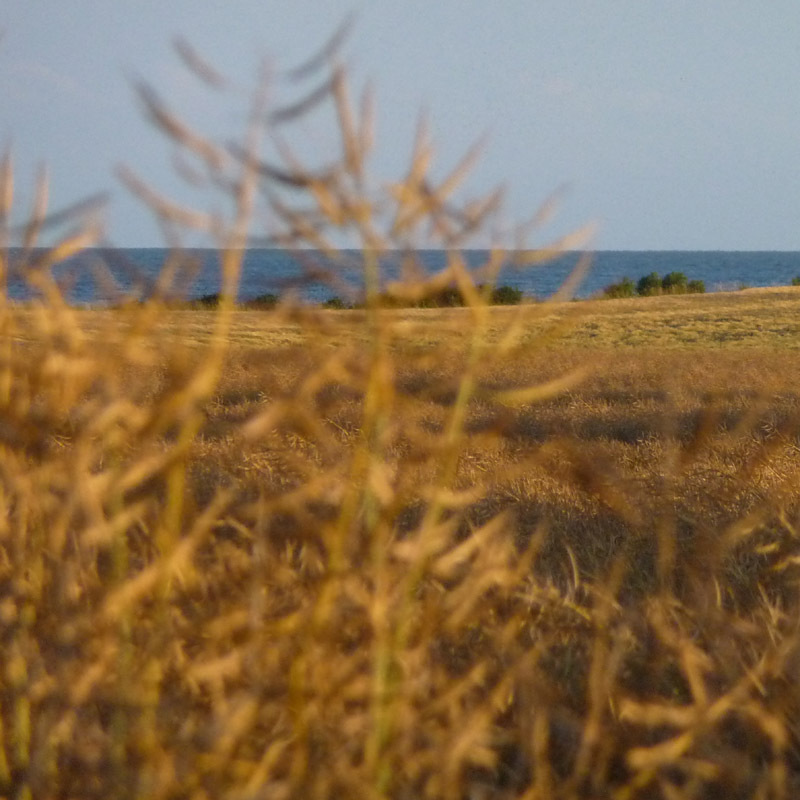 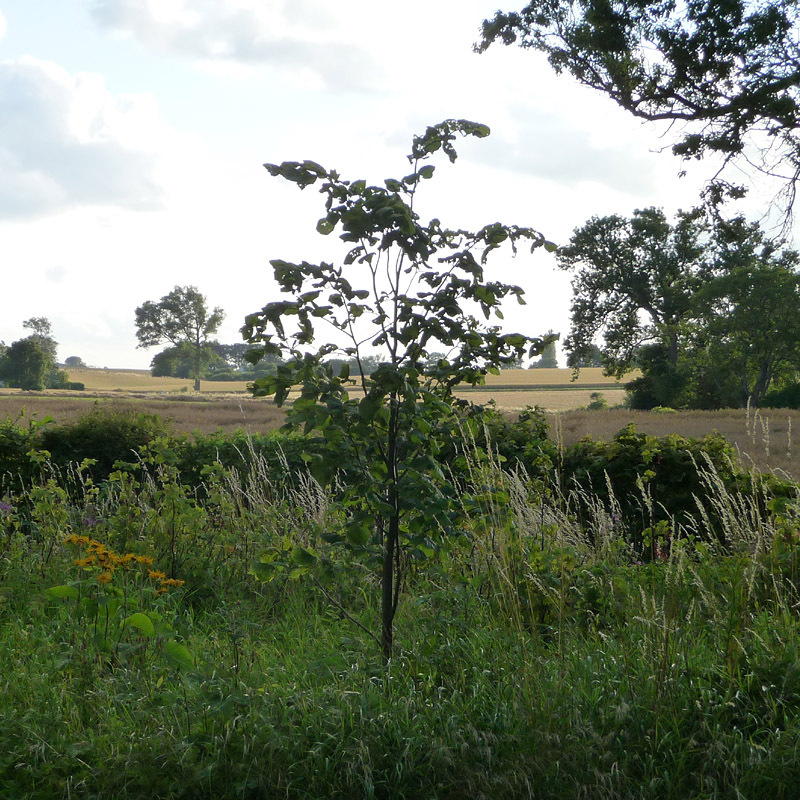 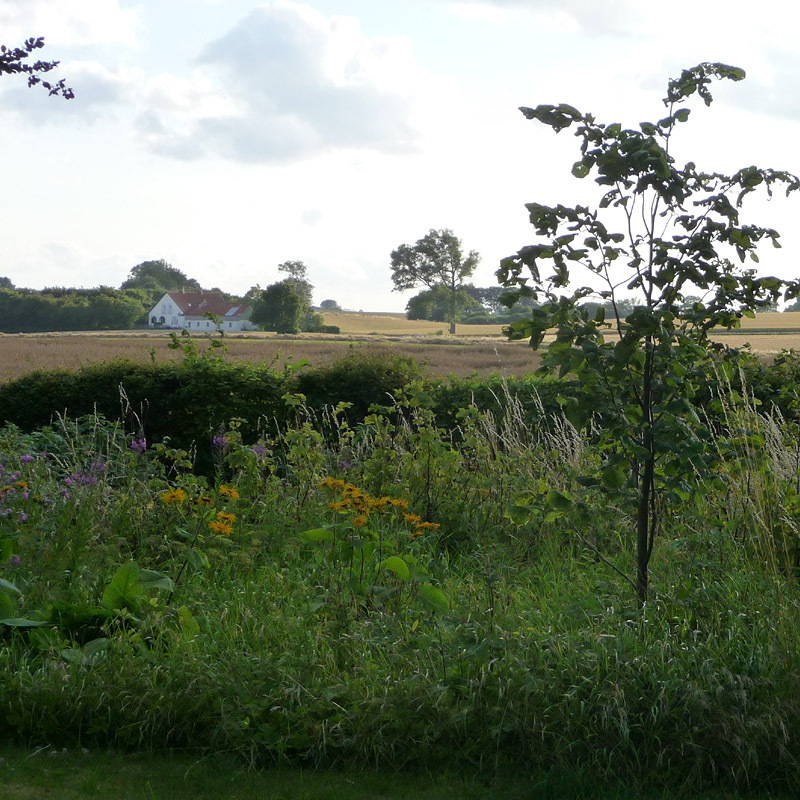 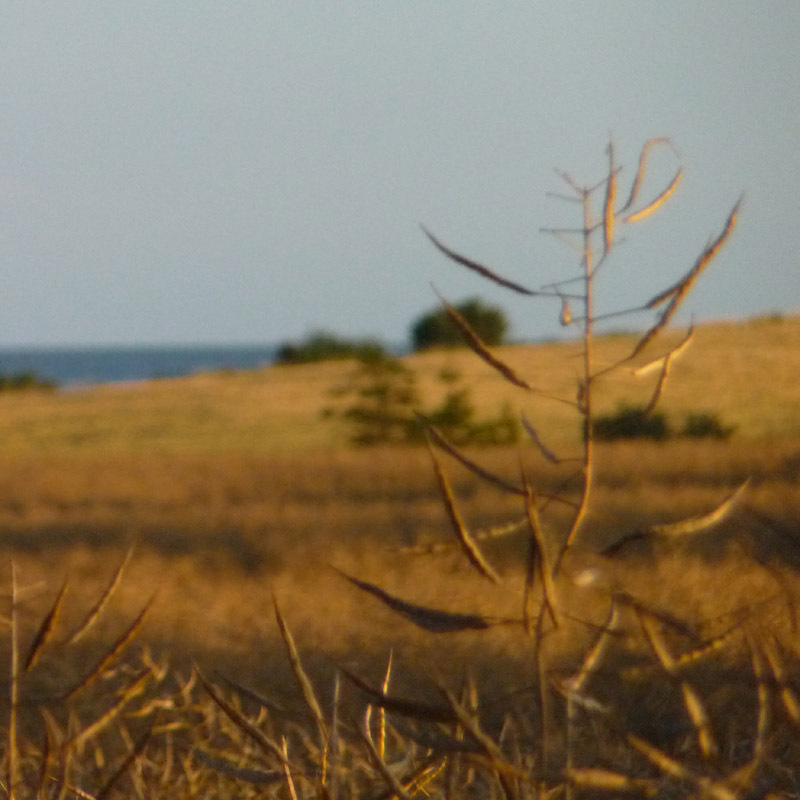 Colours, shapes, objects and landscapes become one with the peace that descends on rural life. 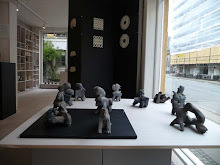 Things arouse from the history of material and reason mixed with an investigative joy of creation. 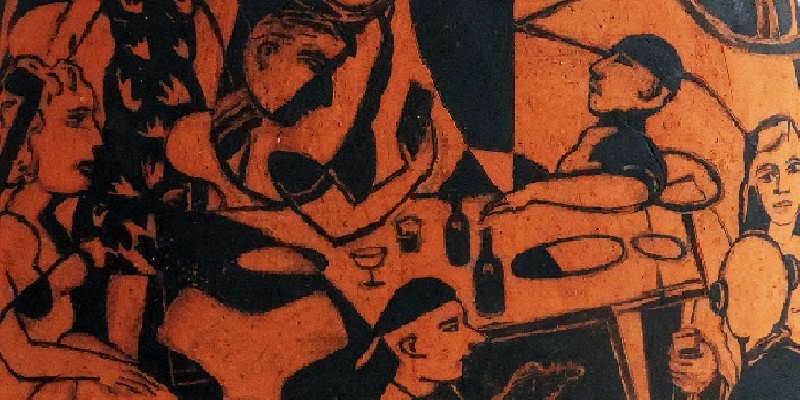 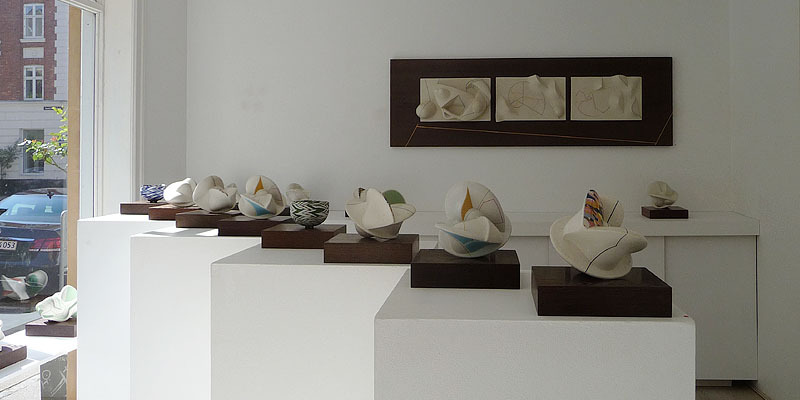 "I have worked with clay and ceramics for over 60 years. 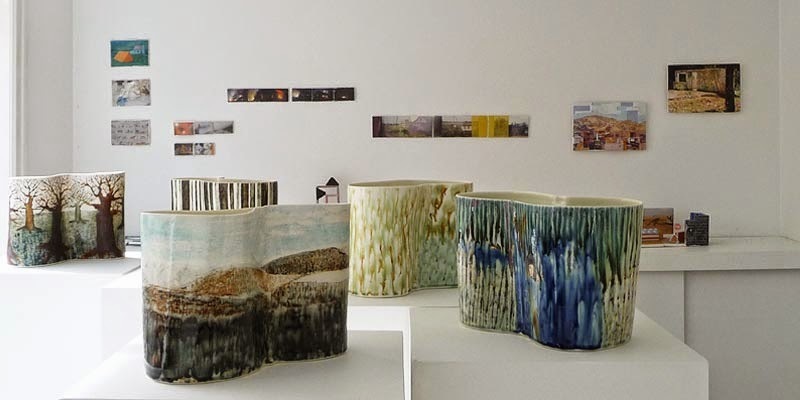 My work has been about equally divided between modelled objects and commission projects, - and then functional things produced in my own studio or designed for industrial production. 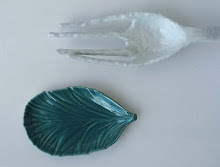 One has not taken up more or been more important than the other. 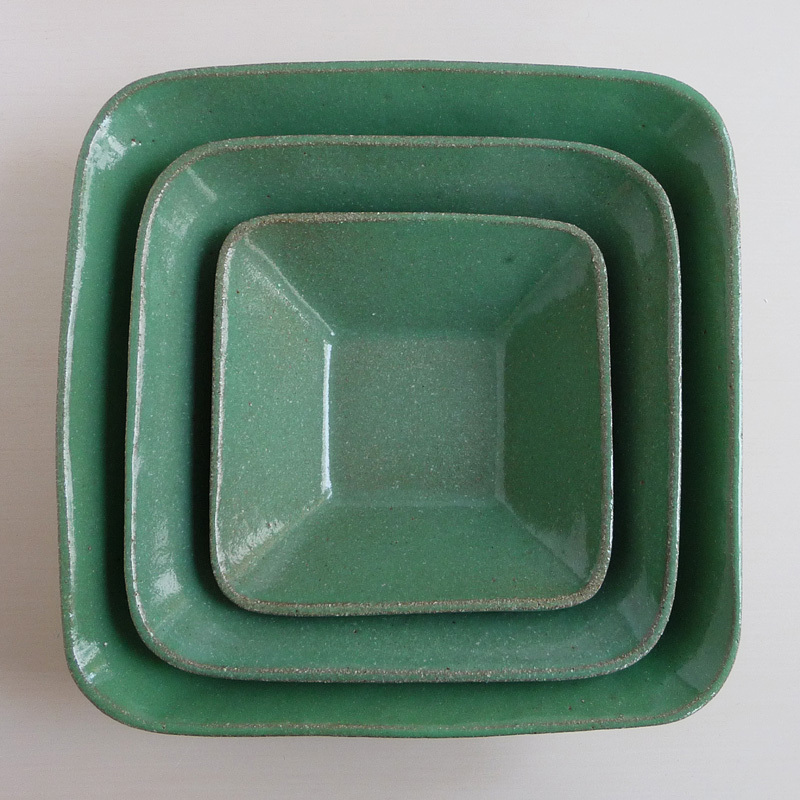 When switching between one and the other, it is experienced anew every time a new task occurs. 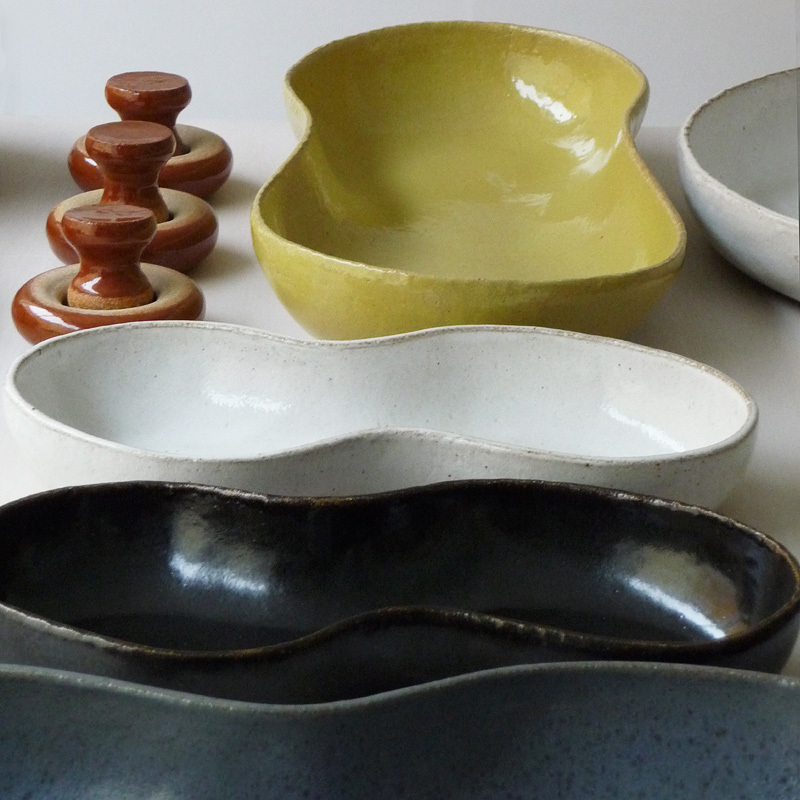 Many old and newer things and moulds, I have set aside over the years. 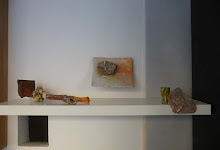 When I get a new inquiry, like a small mortar I made in the sixties on Bing & Grondahl, I take the form into the workshop and set out to redo it again. 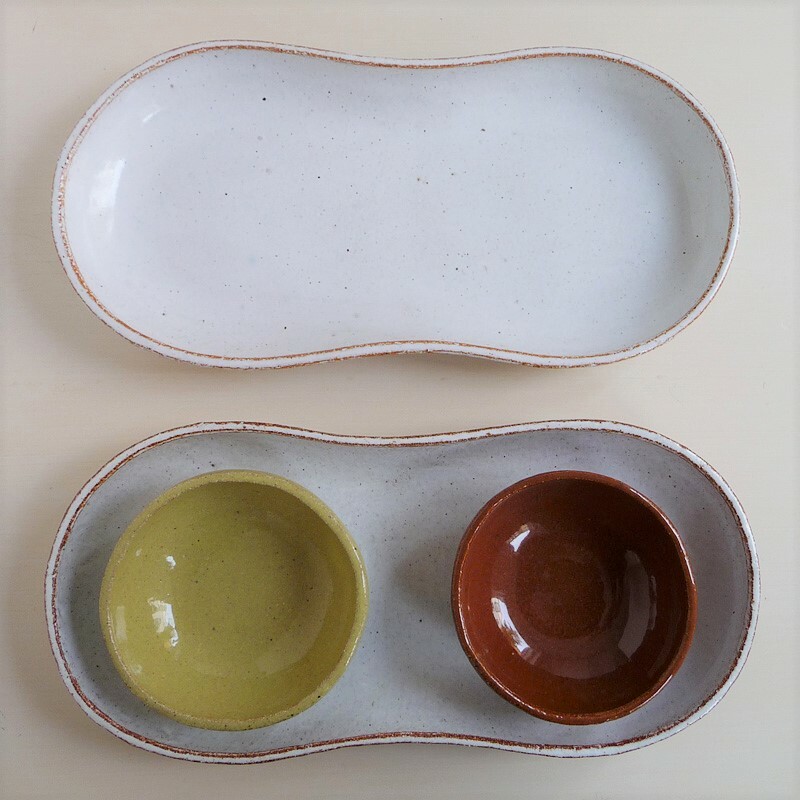 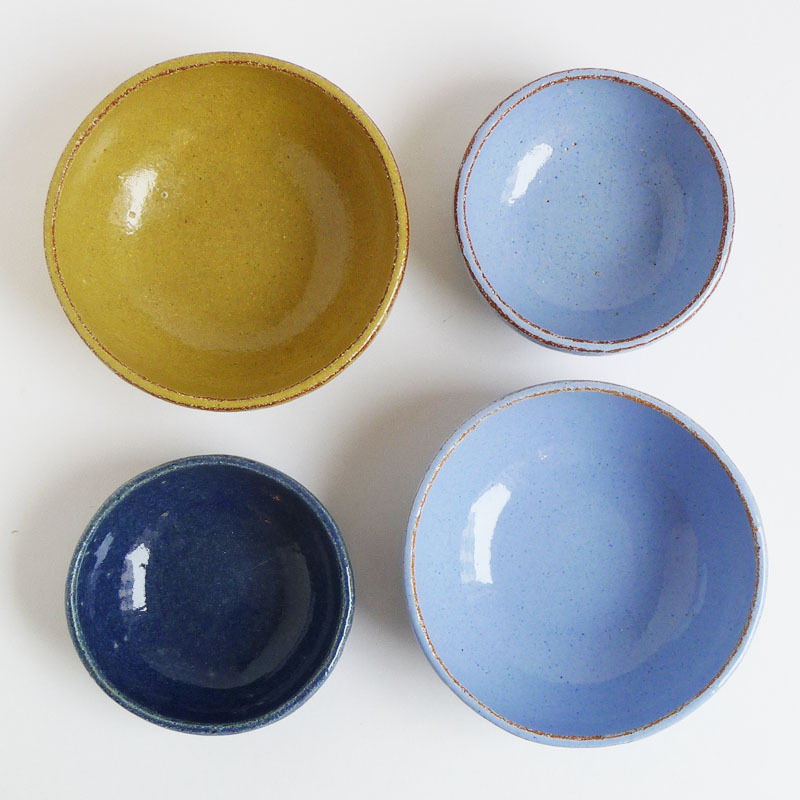 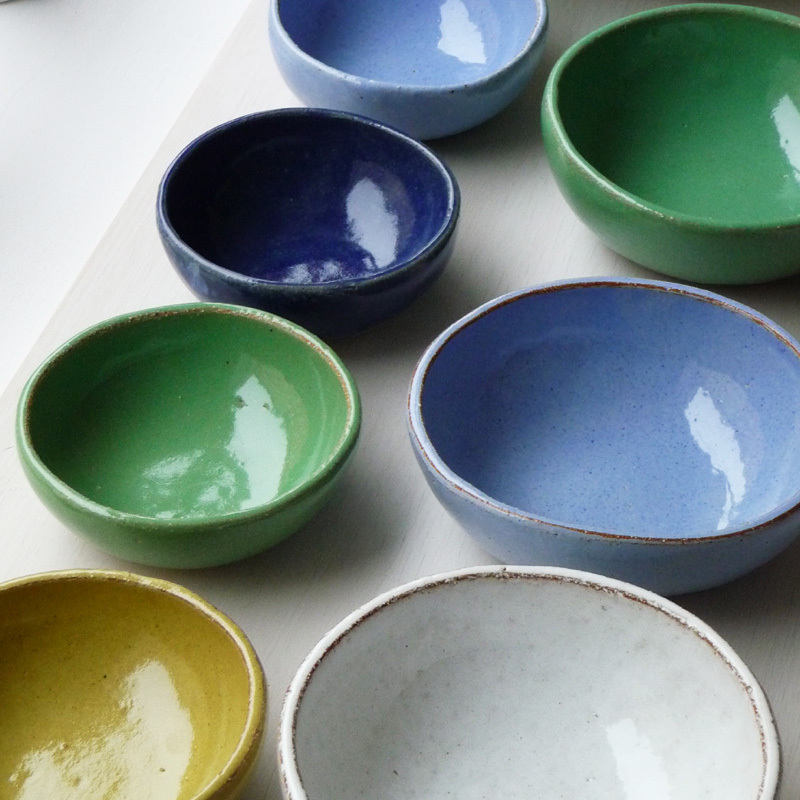 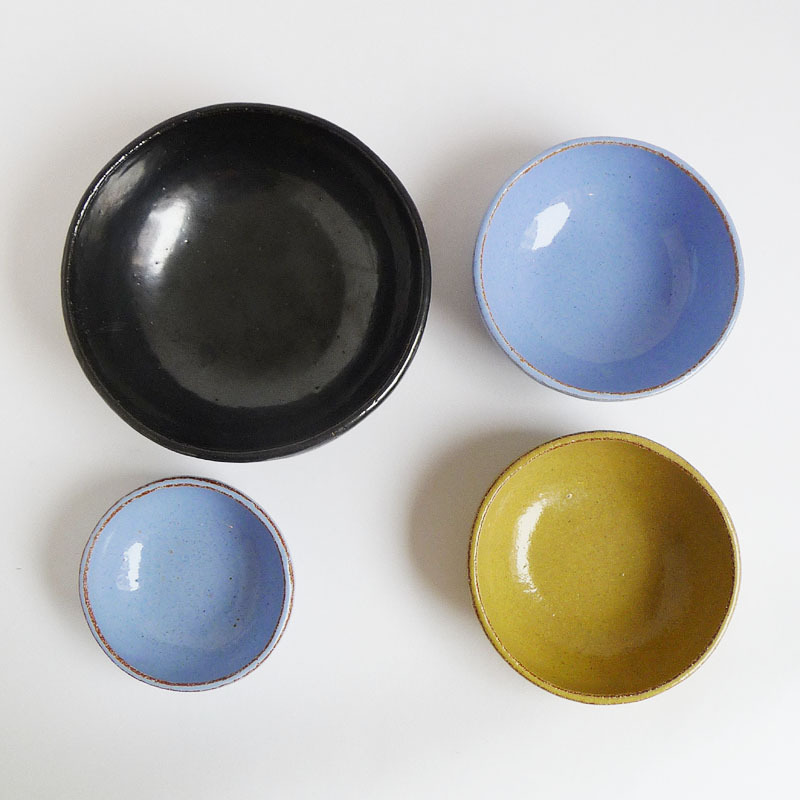 The bowls, plates and dishes for this exhibition are a mix of older designs and new colours, most of which are done in the summer of 2018." 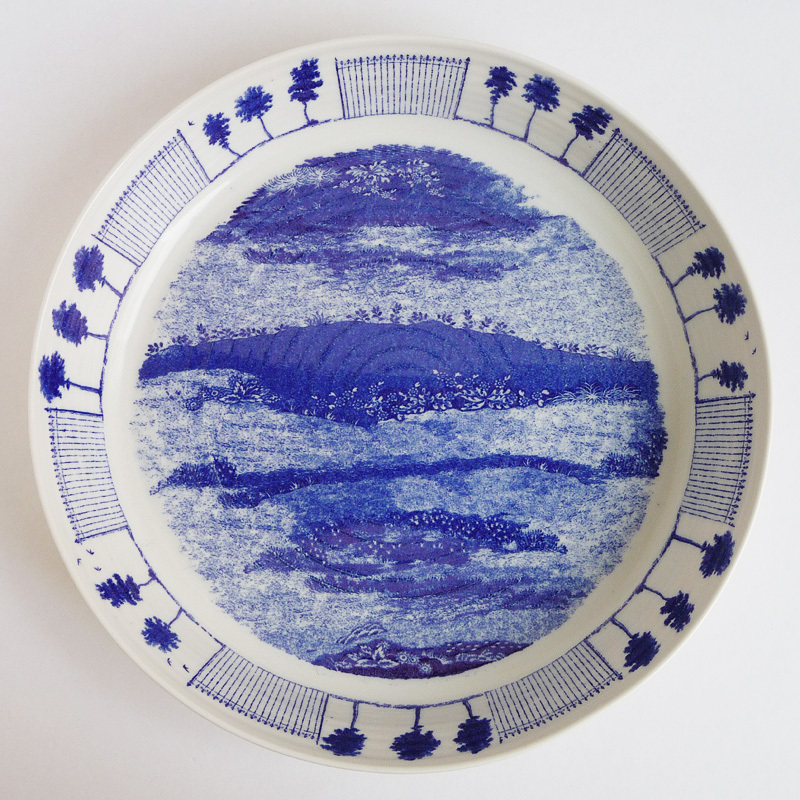 Ursula Munch-Petersen was born in 1937 on the Danish island of Bornholm. 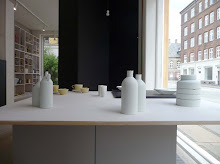 Following her studio experience on The Hjort Factory in Rønne and education at the Arts&Crafts School (now: Royal Danish Academy Design school) 1956-60, she was employed at Artist Studios of the porcelain factory Bing & Grondahl 1961-68, and designer for The Royal Copenhagen and Kaehler. 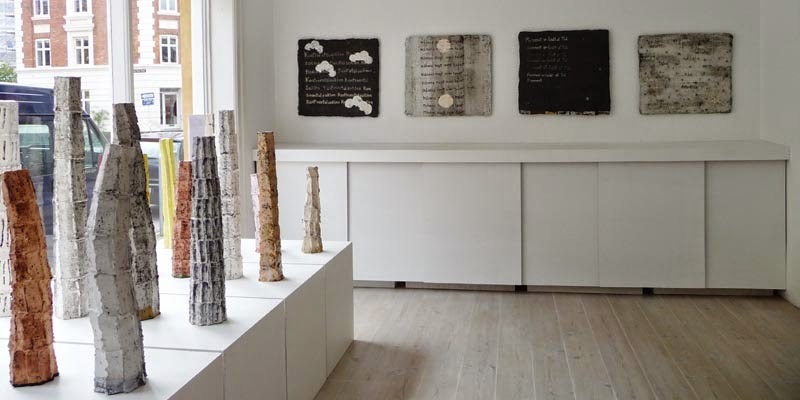 She has received numerous grants and awards including The Danish Arts Foundation Lifelong Award, Denmark's National Banks Foundation's Honorary Award, Bindesbøll Medal, Ole Haslund's Artist Award, Arts&Crafts Council. 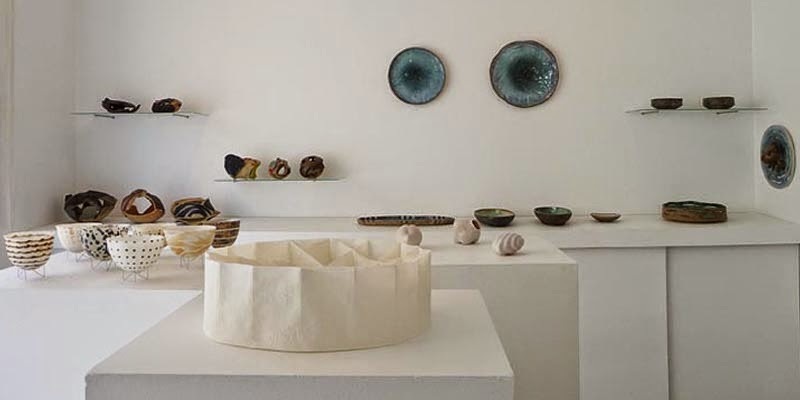 Following an active life as a craftsman and designer with travelling, teaching and exhibitions in Denmark and abroad among others Latvia, Lithuania, Ukraine, the USA, Mexico and China, she has her studio and home in Copenhagen and at the island of Møn. 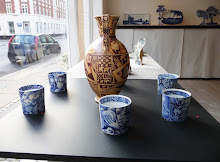 She designed among others faïence tableware 'Ursula' Royal Copenhagen in 1992, pieces in The Larch Set 1994 - and recent public commission is 'Timetable' for the Ancient Roman Road, Jutland 2010. 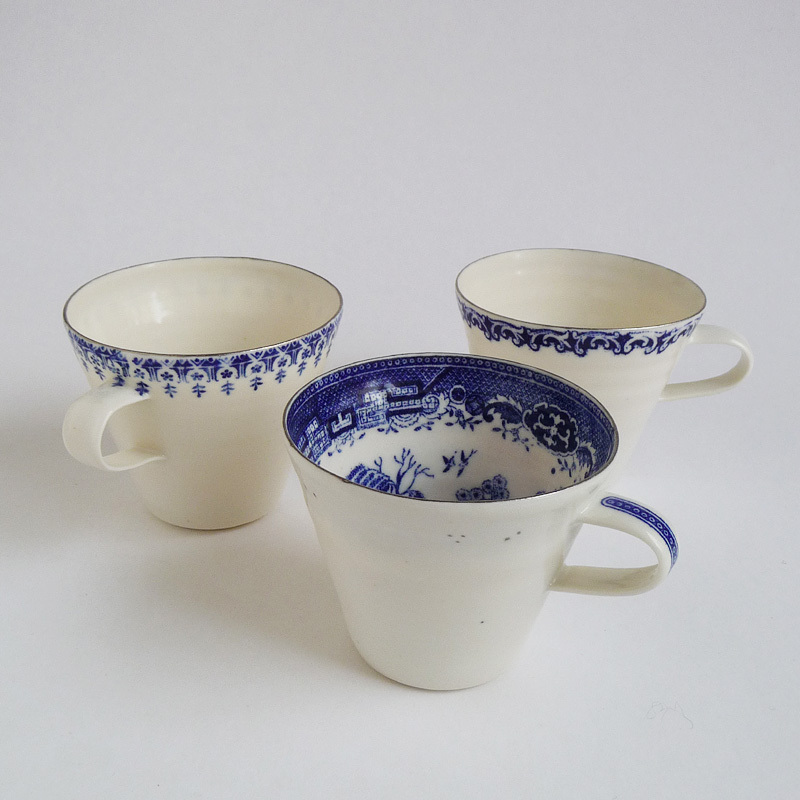 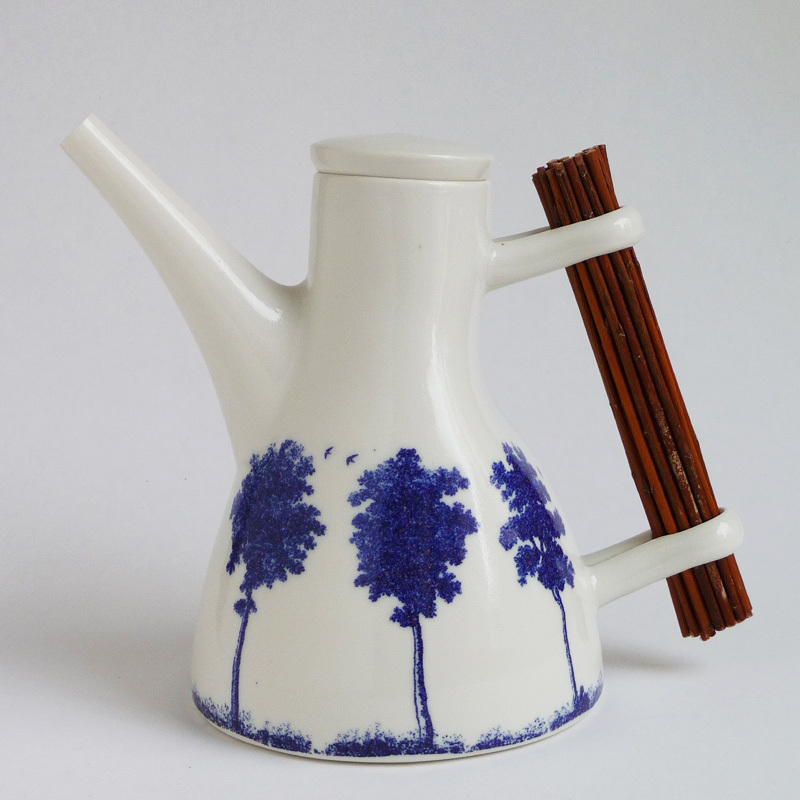 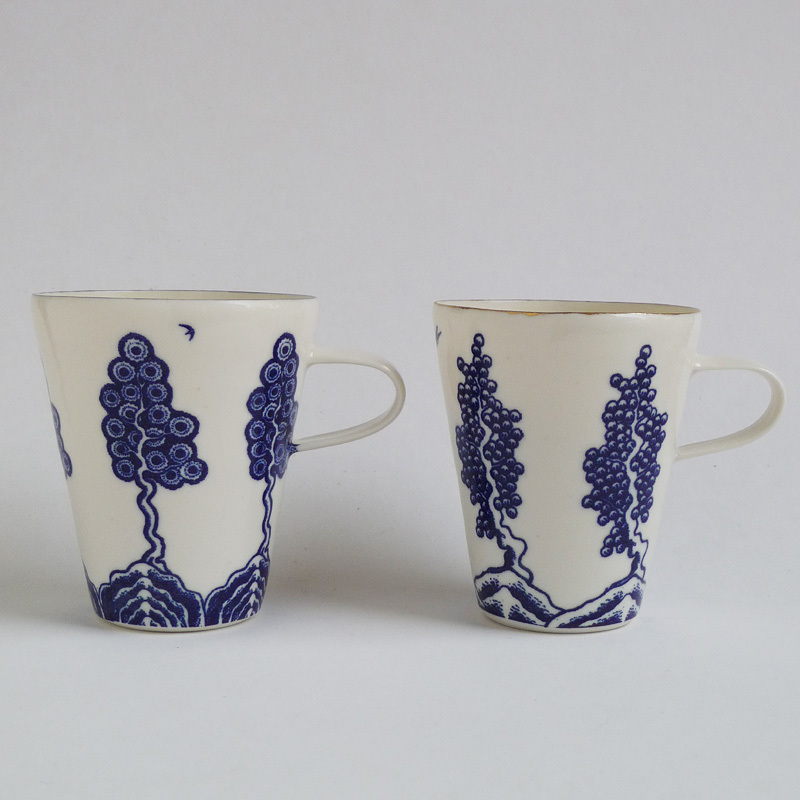 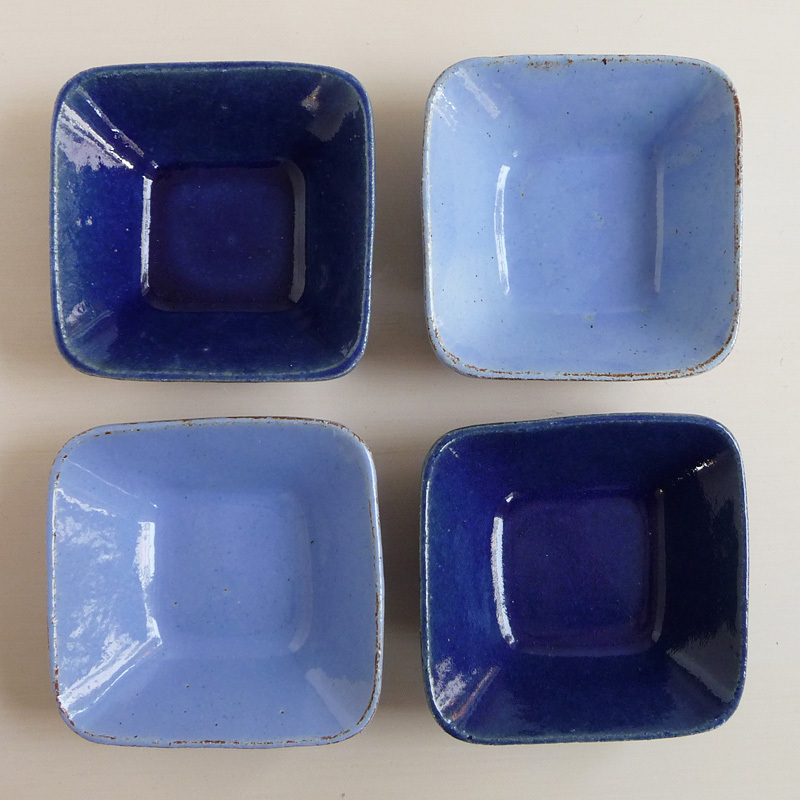 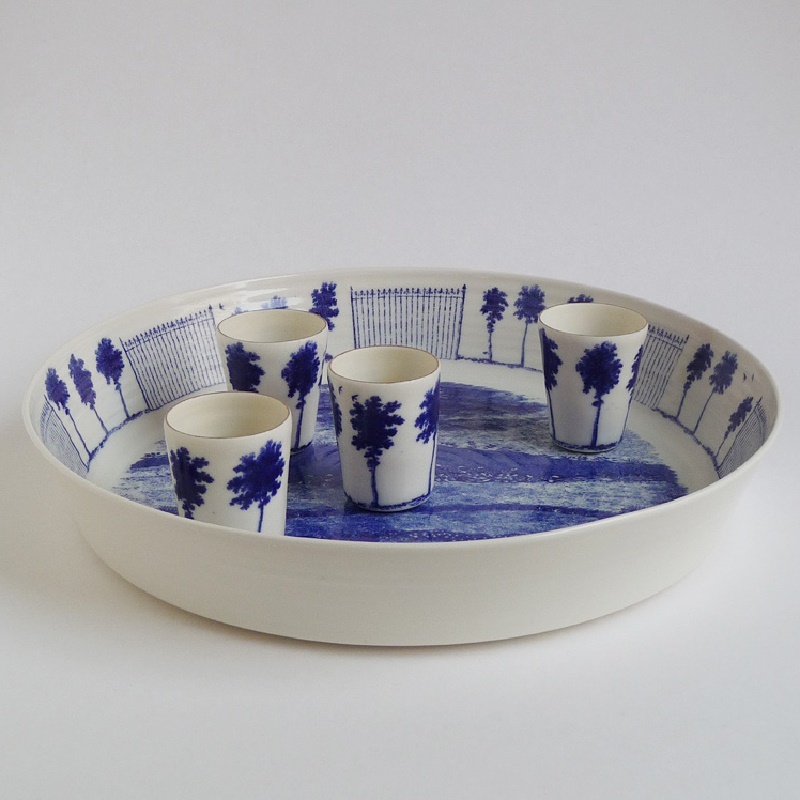 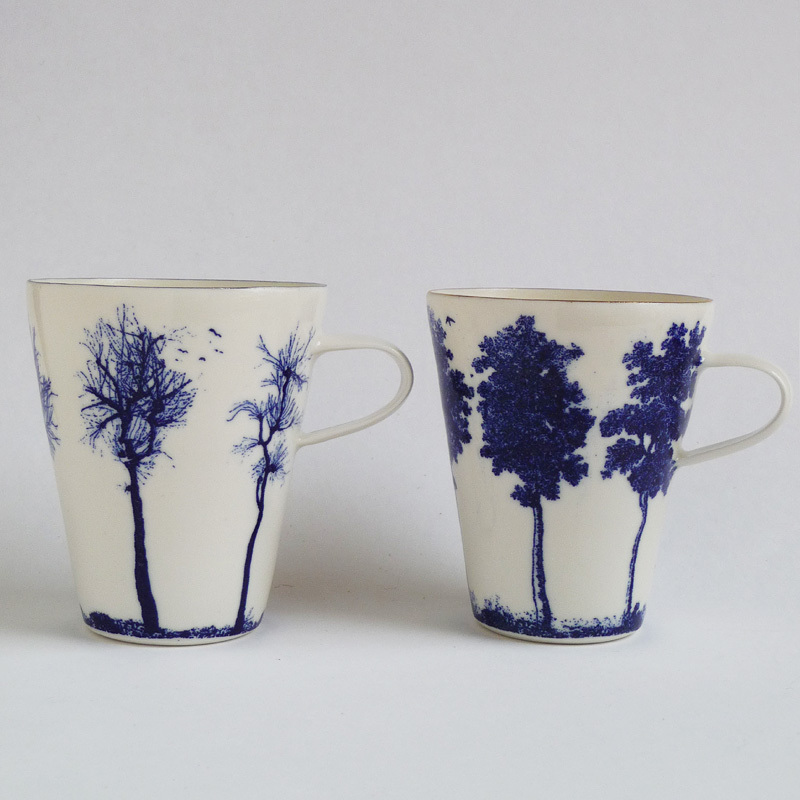 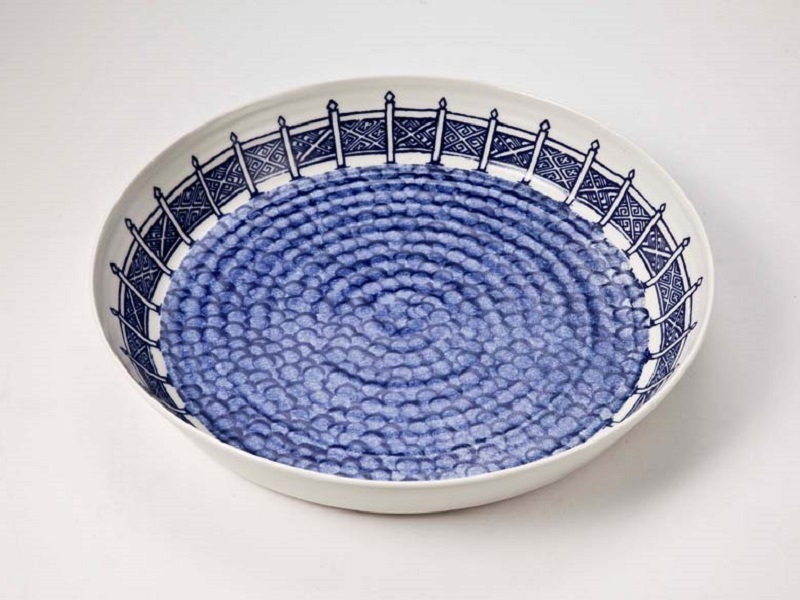 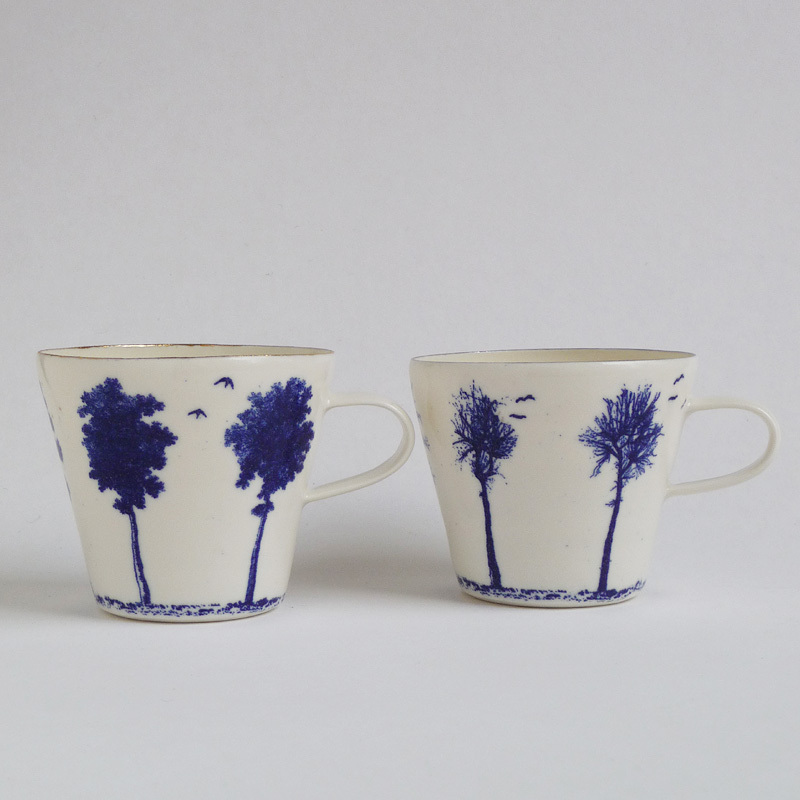 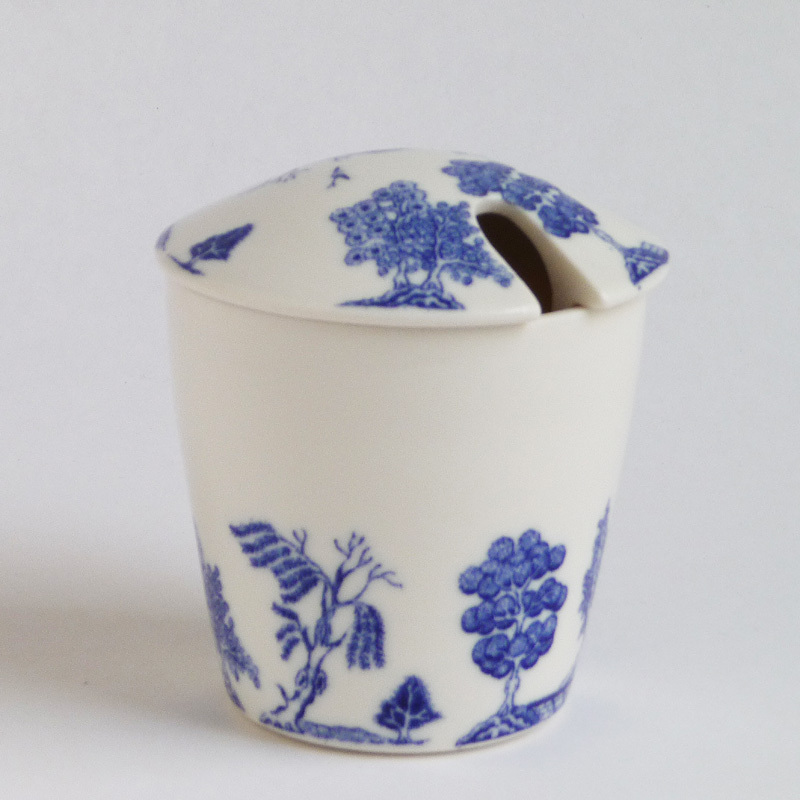 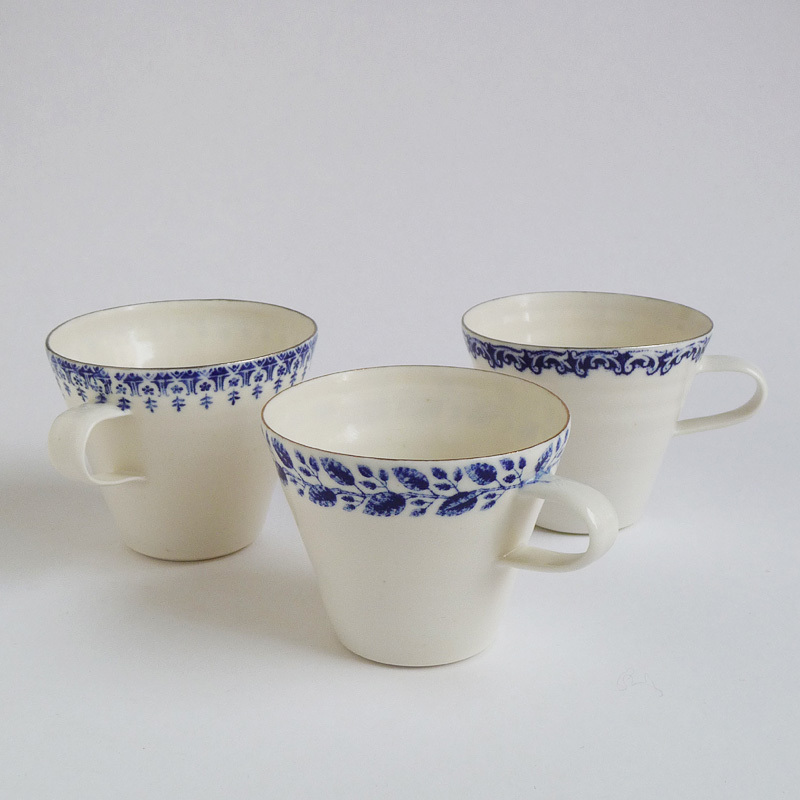 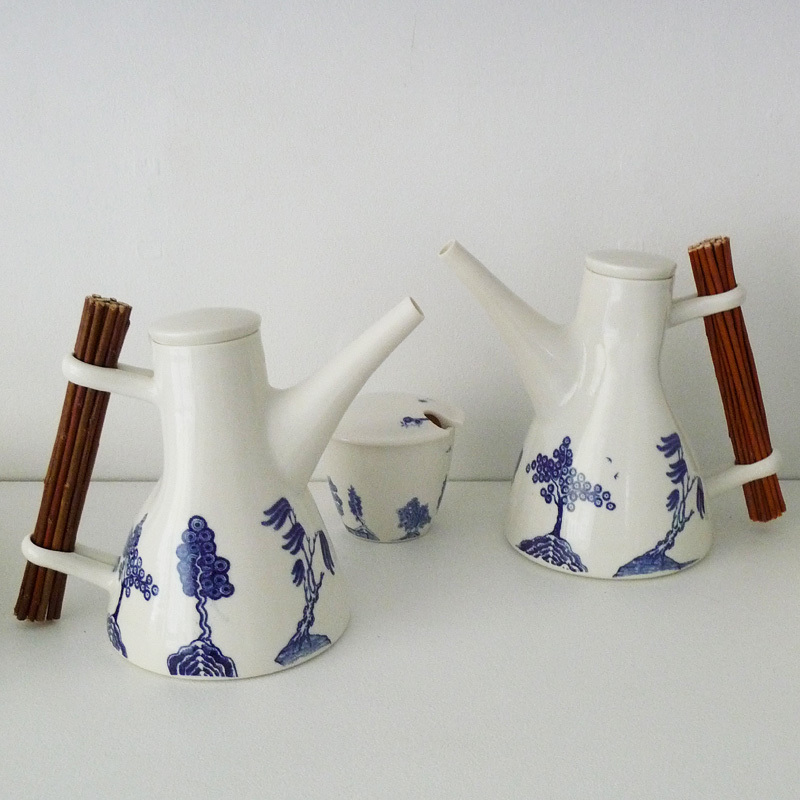 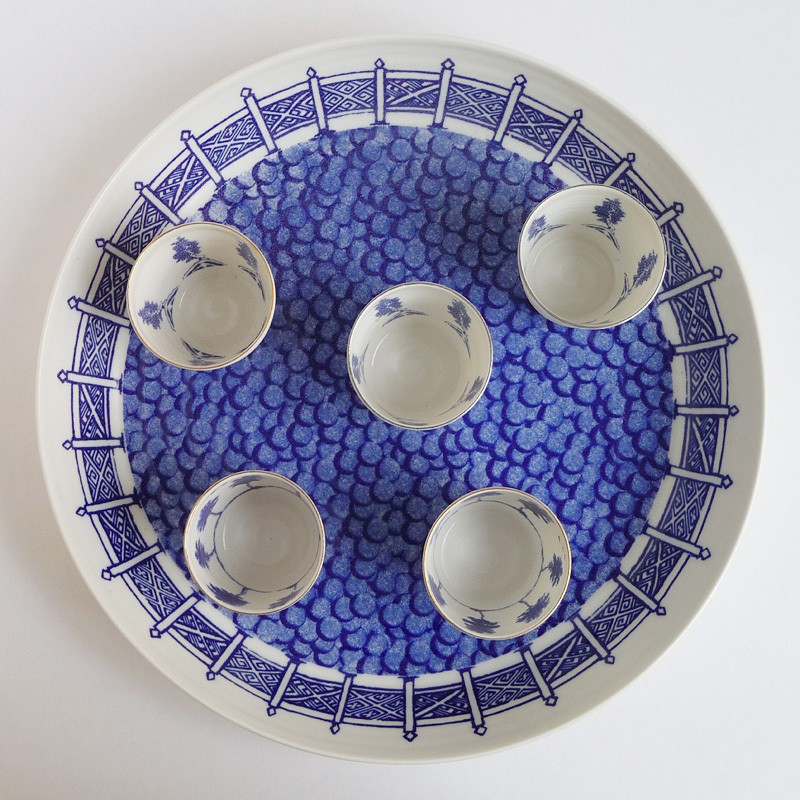 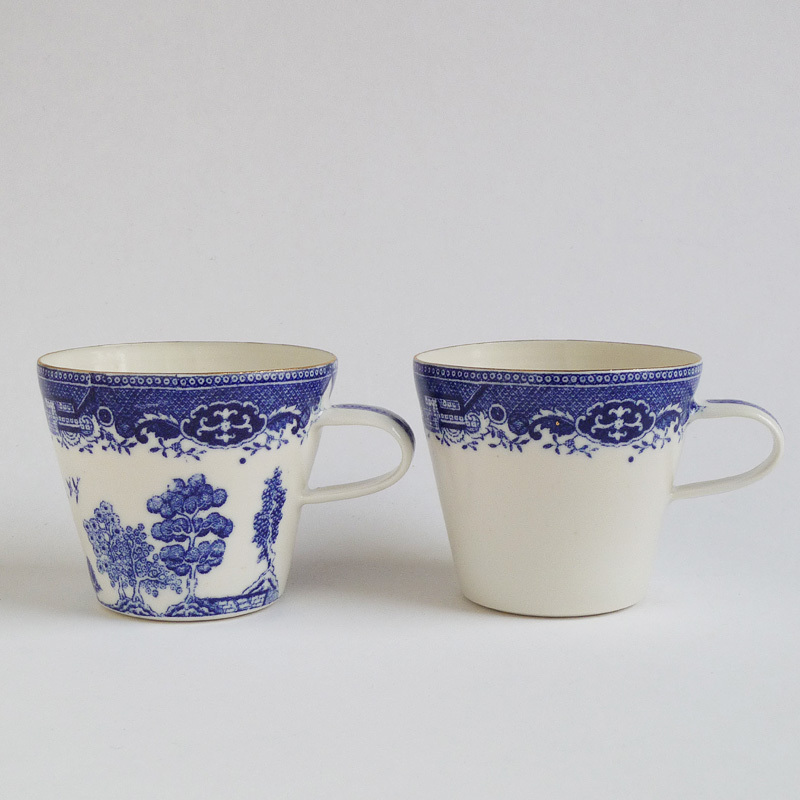 Cobalt blue print on a porcelain set in a Danish-English collaboration. 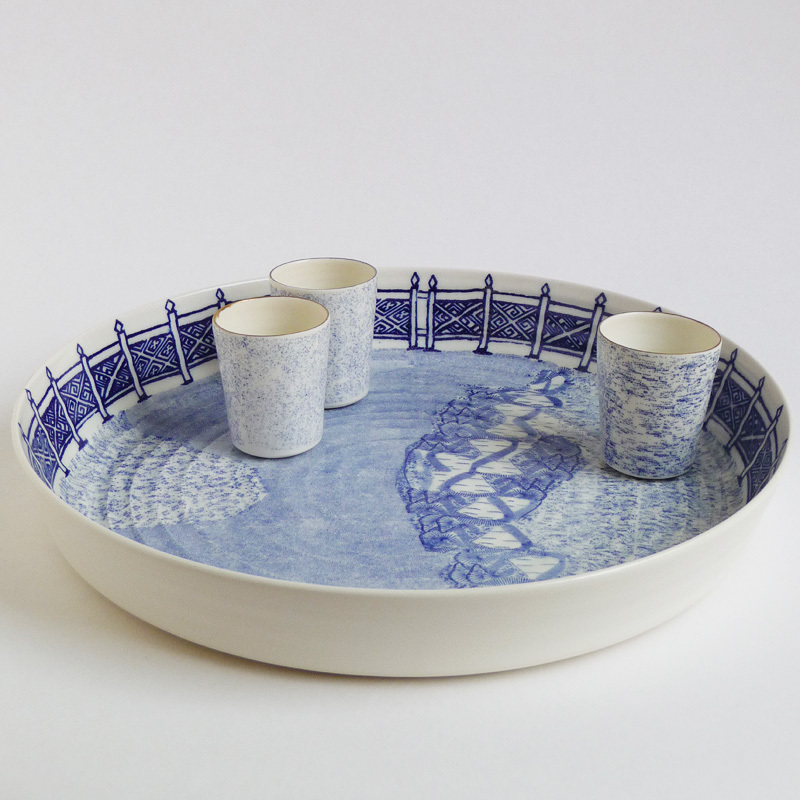 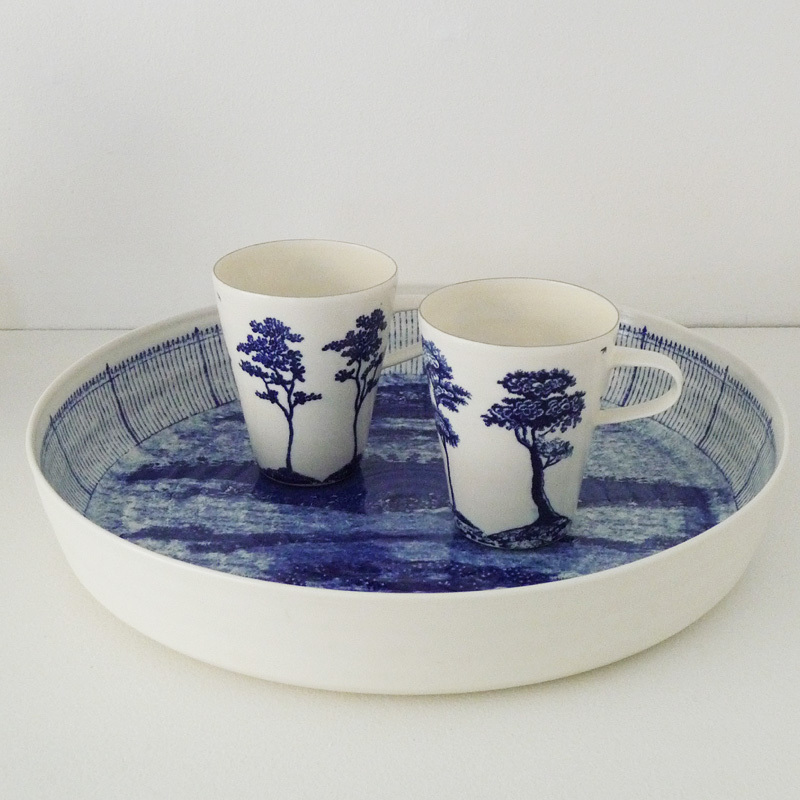 The Landscape Blue set consists of coffee / tea cups, plates, dishes, trays and porcelain tea-lights, designed and hand-thrown by Ann Linnemann and then applied cobalt blue silk screen developed by Paul Scott from motifs previously used in industrial production. 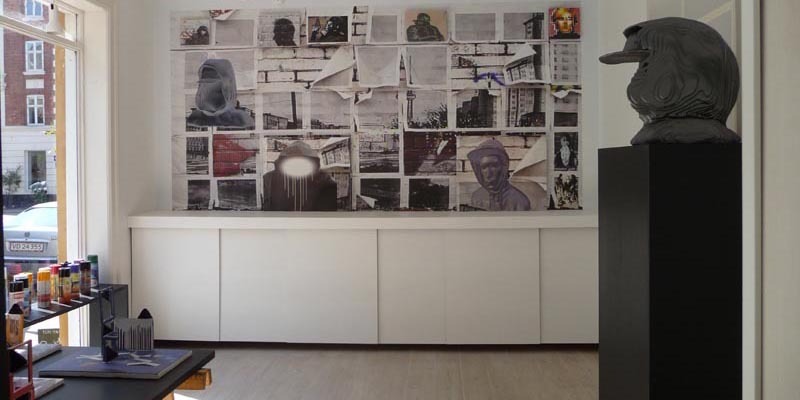 For the exhibition are developed new pieces and renewed use of the blue prints. 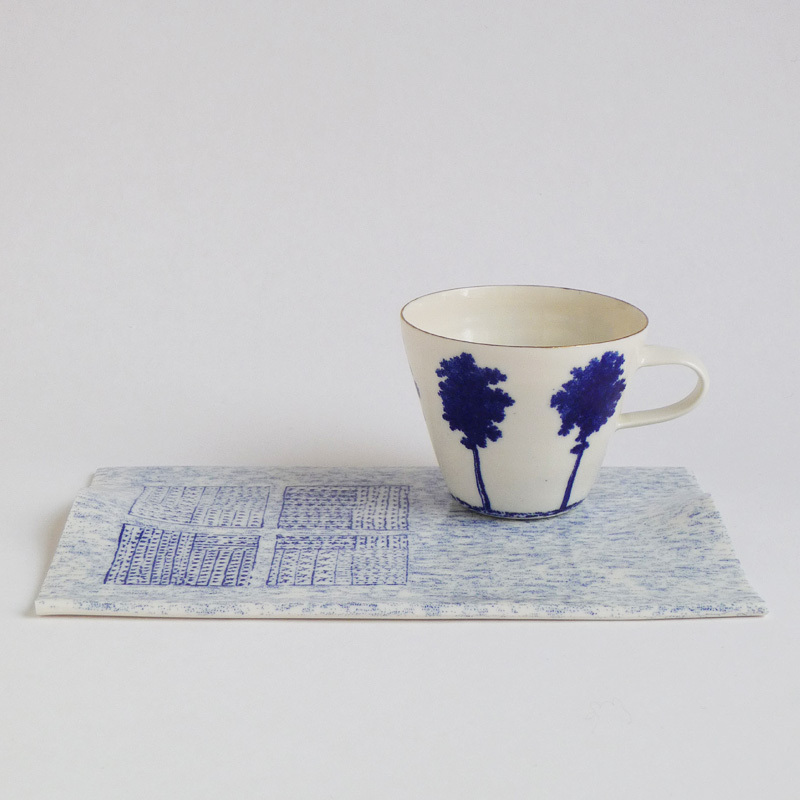 Landscape Blue reflects a multifaceted dialogue between industry and crafts, everyday and the fine coffee-set with gold edging, childhood memories, remembering - and the daily cup of warm drink. 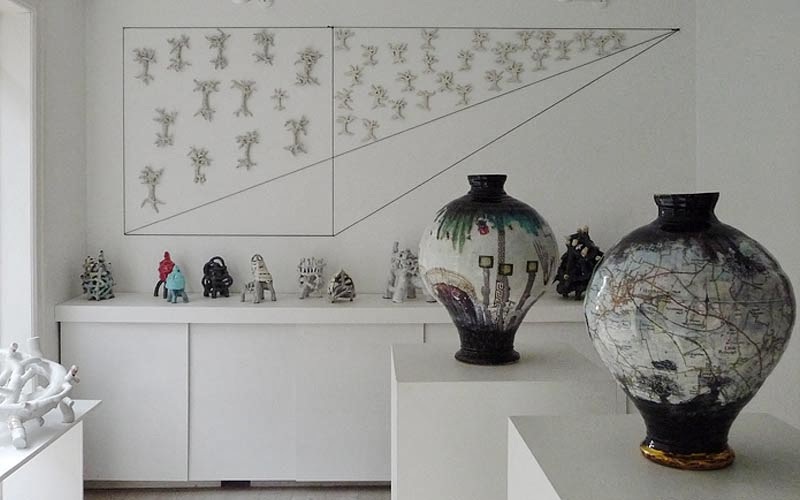 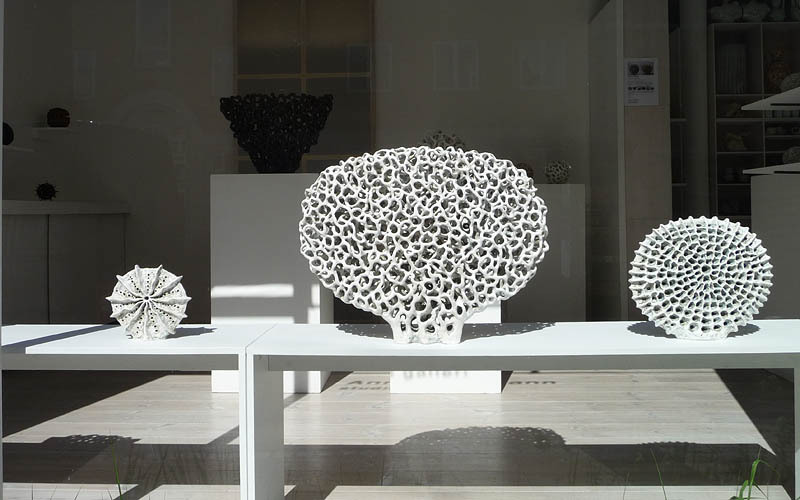 The history of porcelain, social and cultural politics and 'nature-human' are ongoing themes that unfold for the close viewer. 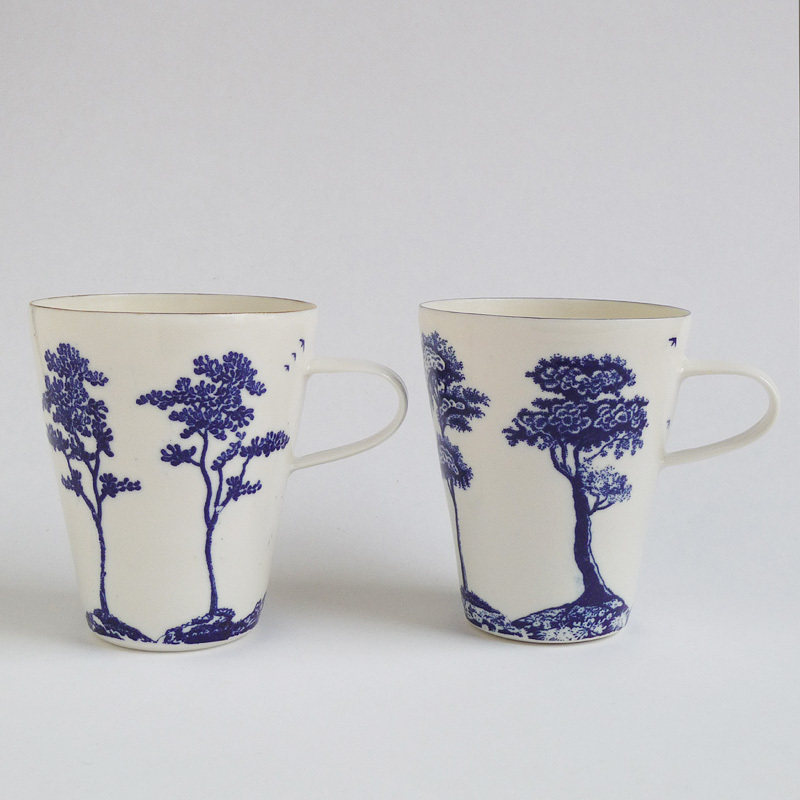 The decorative motifs are made in small series of unique landscape gardens, 'summer and winter trees' from the Royal Garden, ornament-borders inspired from the East or Swedish and English tableware. 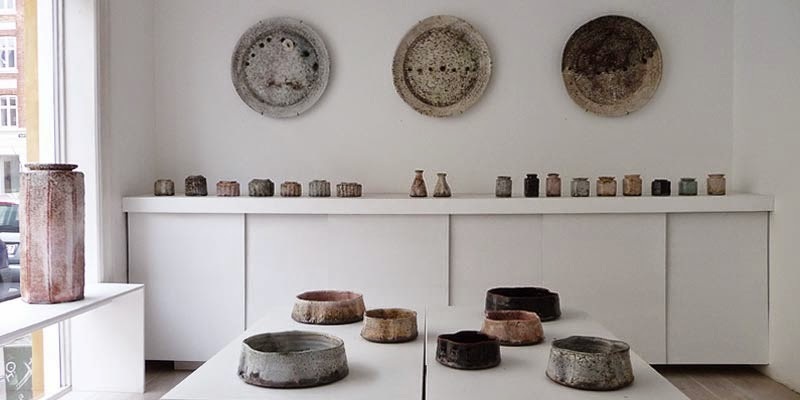 "We are interested in the way that handmade and industrial can be united by creating objects of beauty for use; but even though we work with hand-thrown products and prints we are not interested in our own 'mass production'. 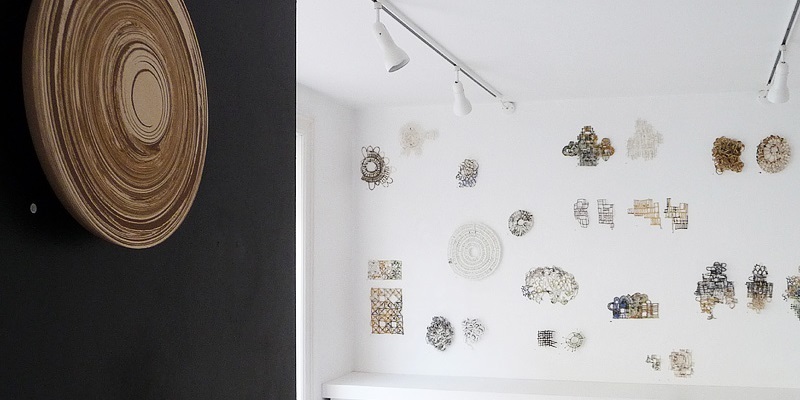 In contrary, the nature of the project creates a distance from impersonal indifferent consumption, playing with industry techniques to wake up social awareness. 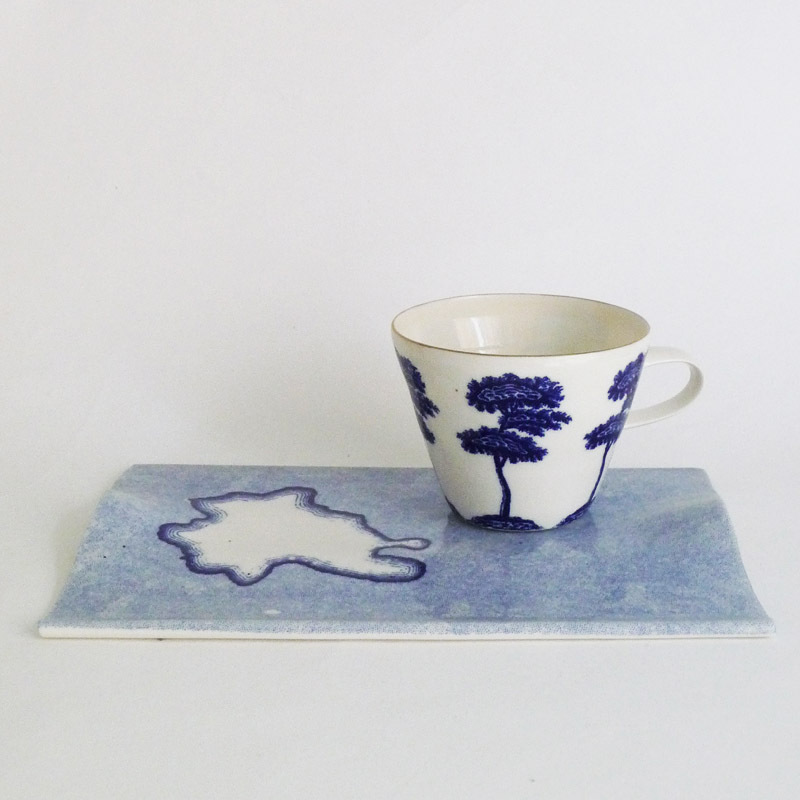 Only a limited number of each print motif is printed and this creates a limitation on how many of the same kind are made. 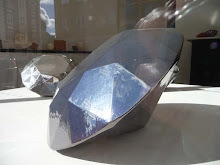 Furthermore, the hand-throwing creates a unique base which means that no two objects are identical." 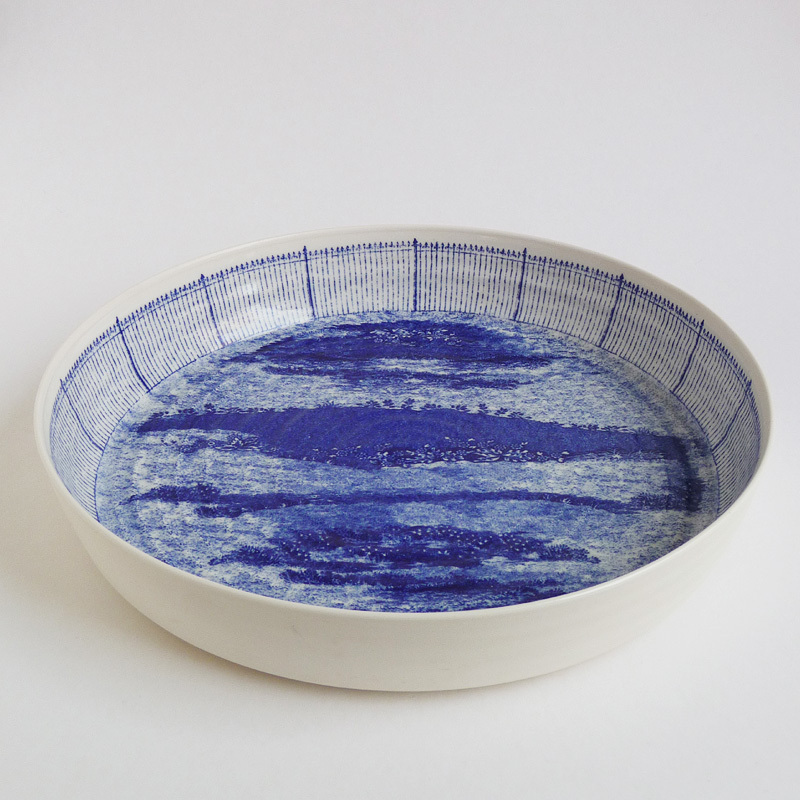 COLLABORATION - Landscape Blue and Body Blue. 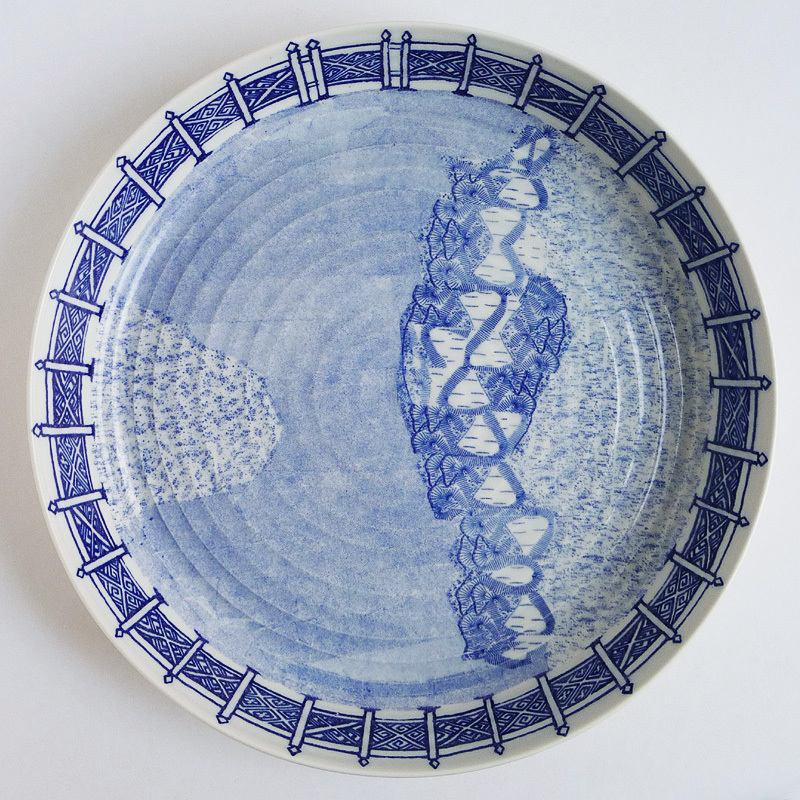 New motifs, edges and borders are derived from different industrial prints, and new items are designed for the set, plates, dishes, serving trays, jugs. 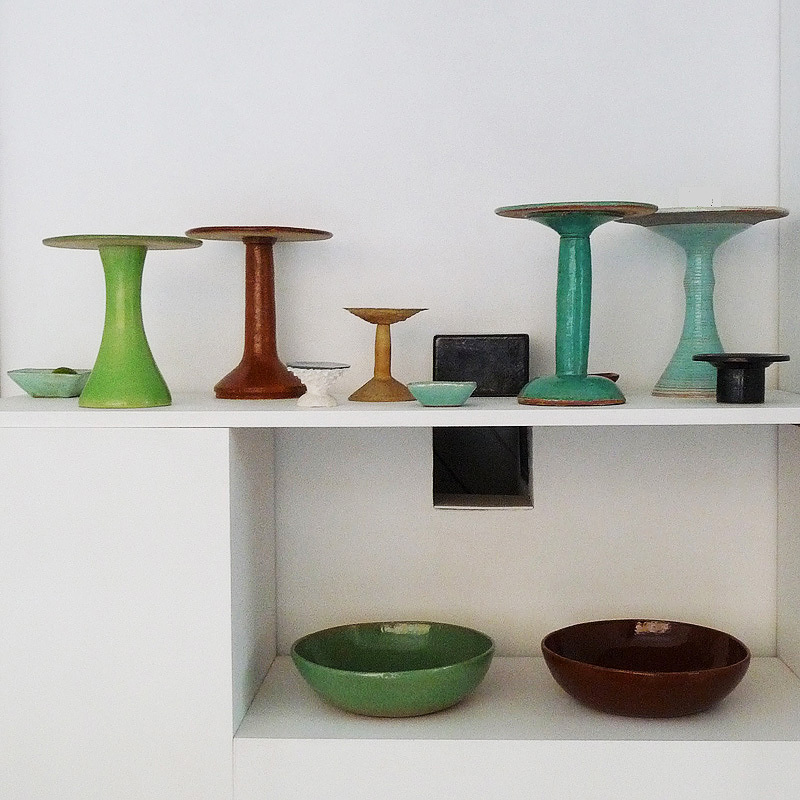 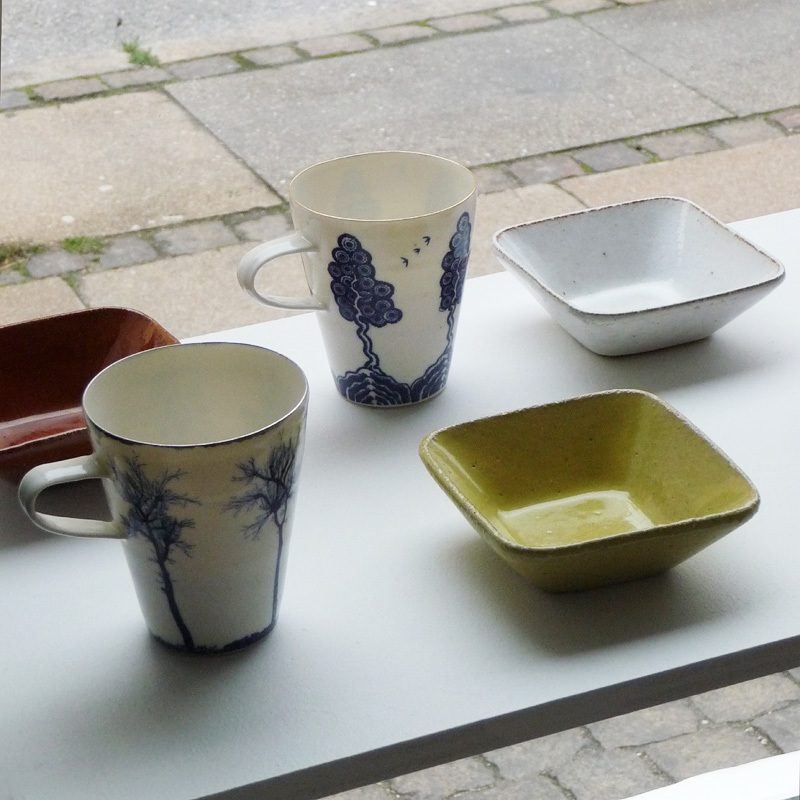 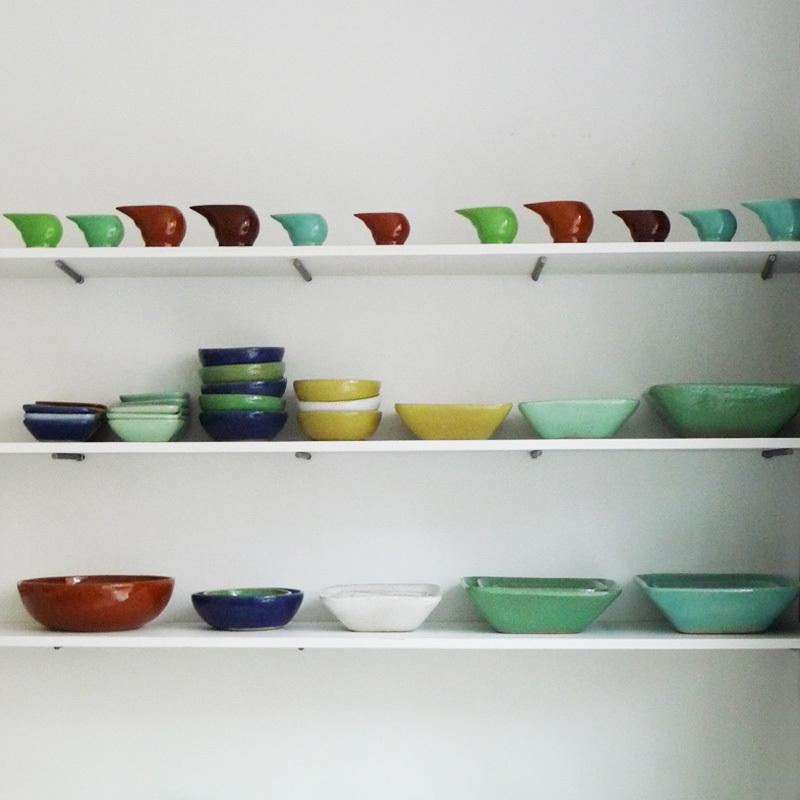 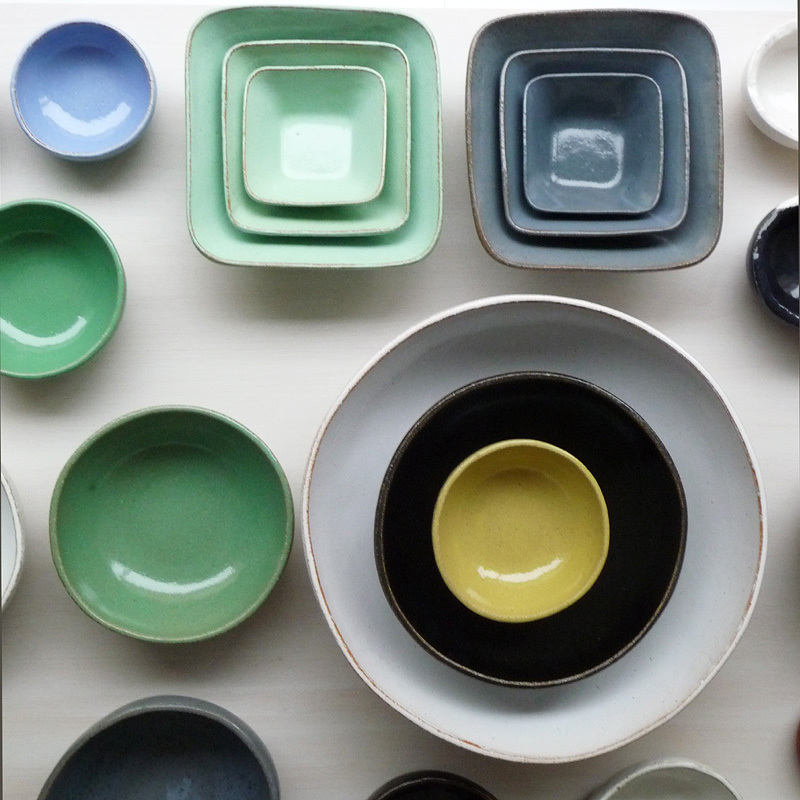 All functional things are designed, hand-thrown, glazed and fired by Ann Linnemann in her studio in Copenhagen, Denmark. 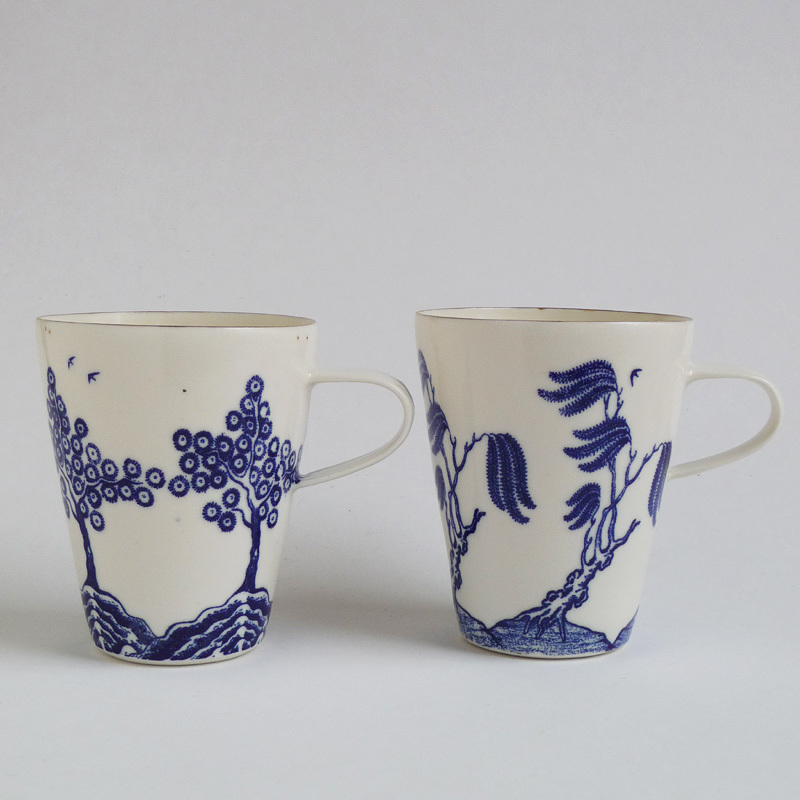 Paul develops the graphic motifs and silk-screen prints the ceramic decals in his workshop in Blencogo, Cumbria, England. 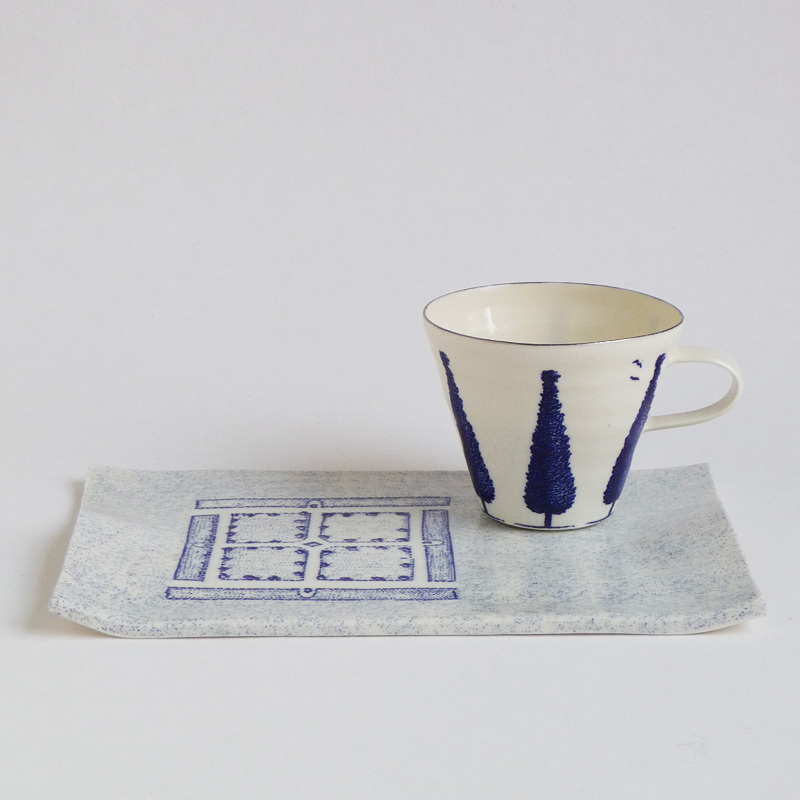 Half of a particular pattern or graphic is available from Paul and half from Ann. 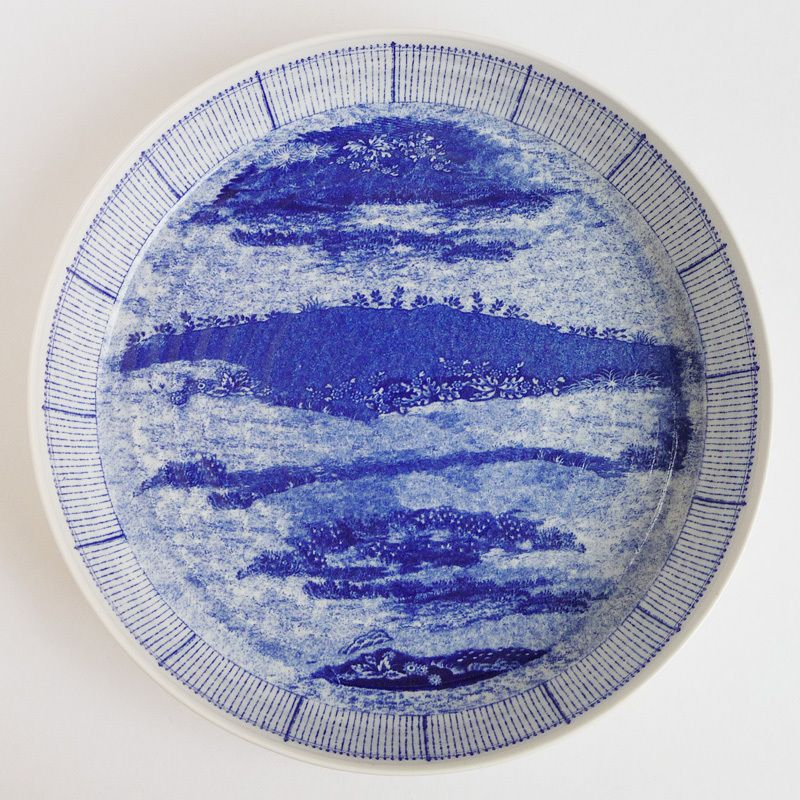 The finished articles that undergo a total of four different firings, are created both in Copenhagen and Blencogo - as each artist shares and attaches the printed decals to the porcelain before adding fine rims of gold and platinum-lustre on selected pieces. 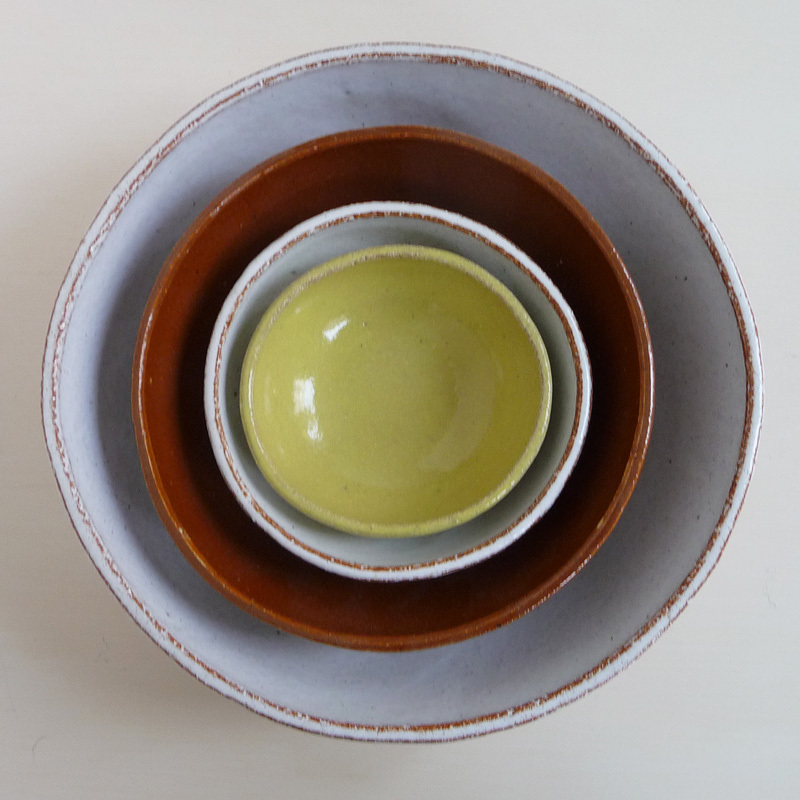 All pieces are signed and stamped with signature and logo. 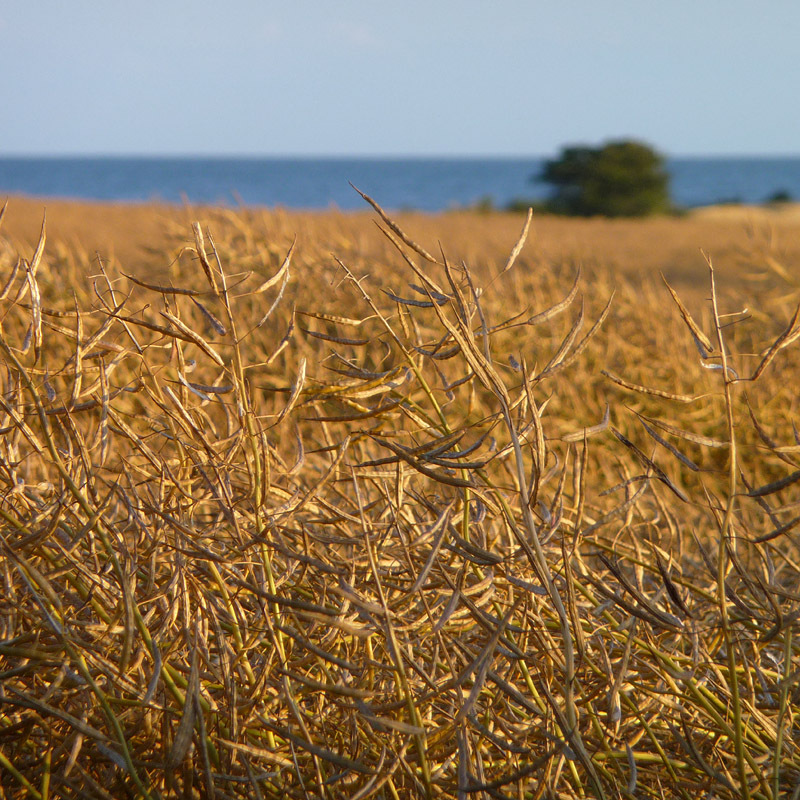 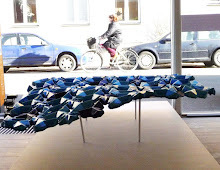 The project was awarded by the Danish National Arts Foundation in 2009.